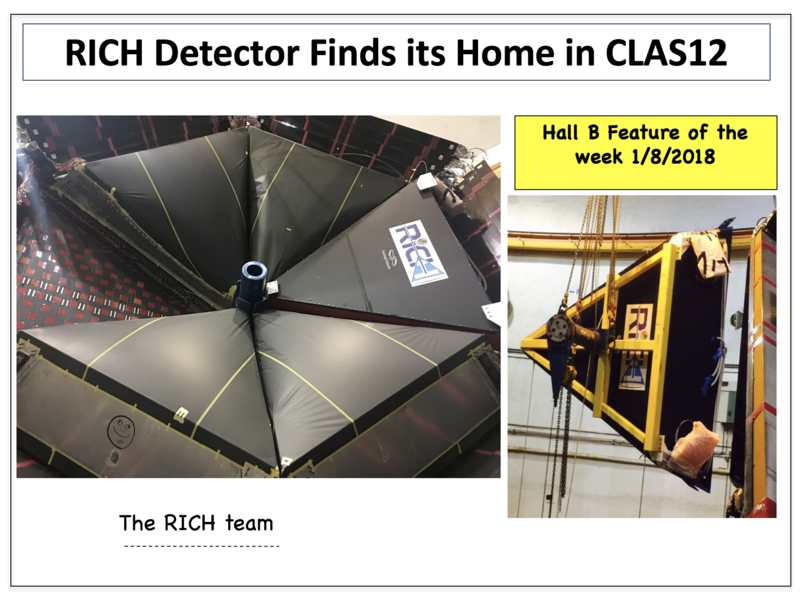 January 8, 2018 - Slide highlighting the successful installation of the RICH detector on the Forward Carriage in Hall B.
November 13, 2017 - Slide highlighting the completion of the Central Detector installation and the successful test with the solenoid in the full 5-T field. 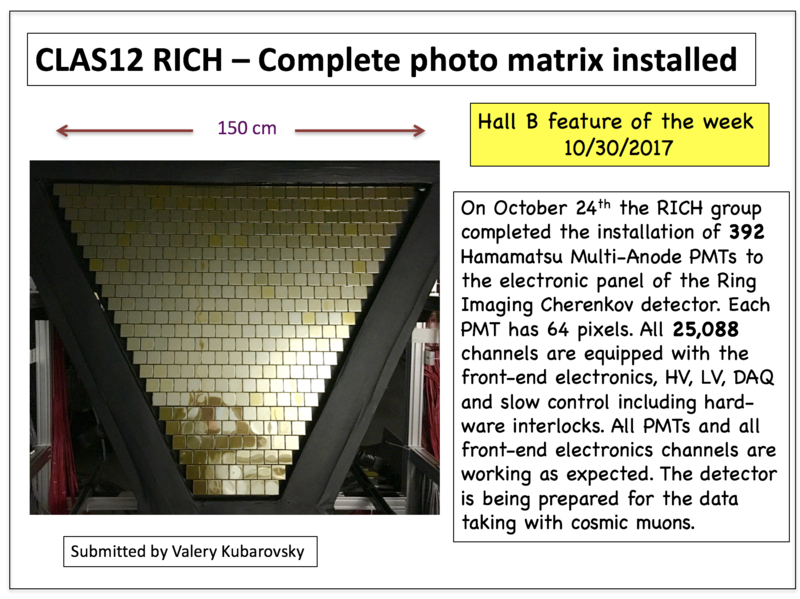 October 30, 2017 - Slide highlighting the completion of the installation of the RICH photo-matrix. 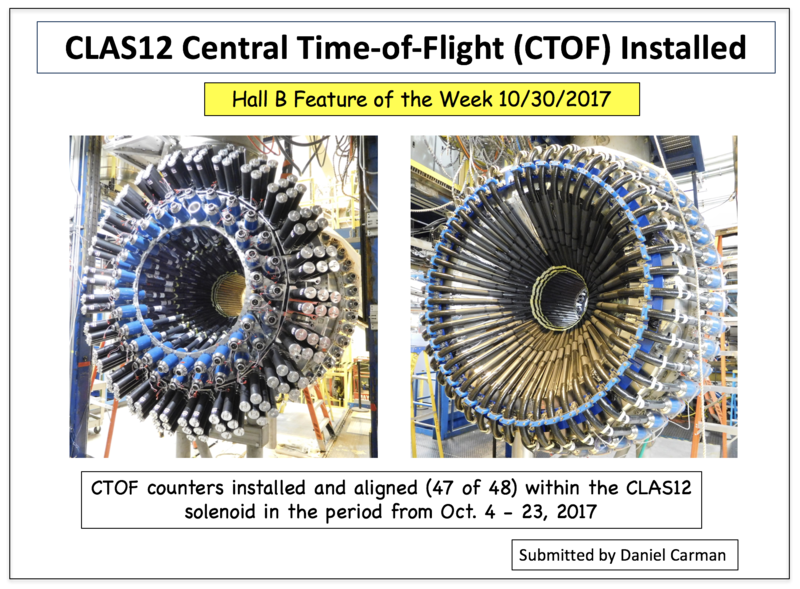 October 30, 2017 - Slide highlighting the successful installation of the CTOF system. 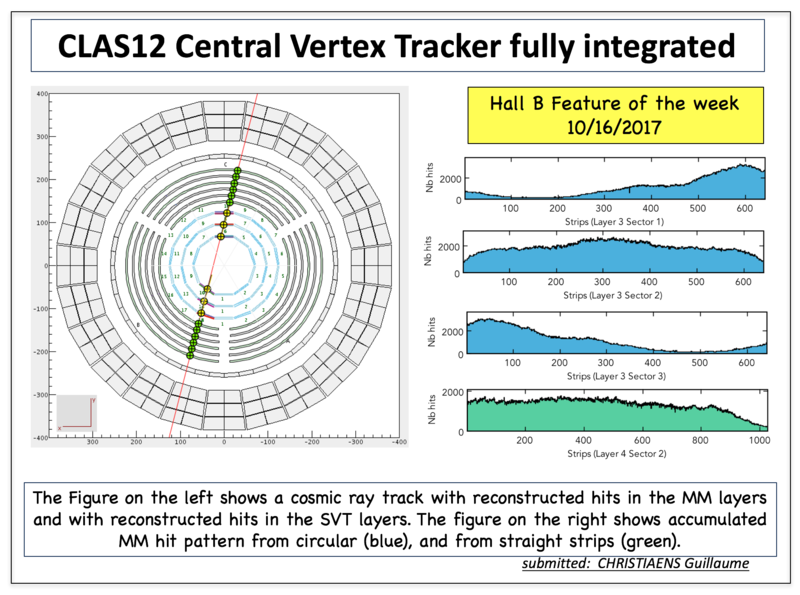 October 16, 2017 - Slide highlighting the successful integration of the full CVT system. 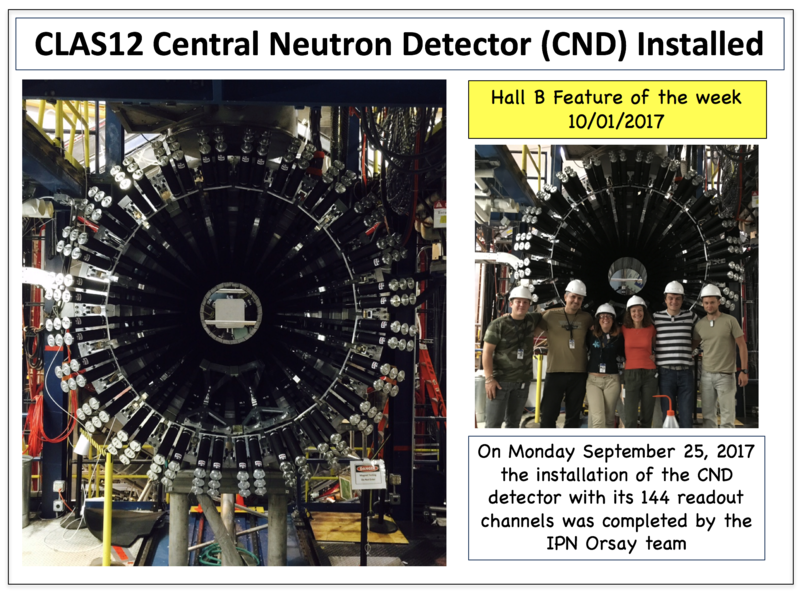 October 9, 2017 - Slide highlighting the successful installation of the CND system by the IPN Orsay team. 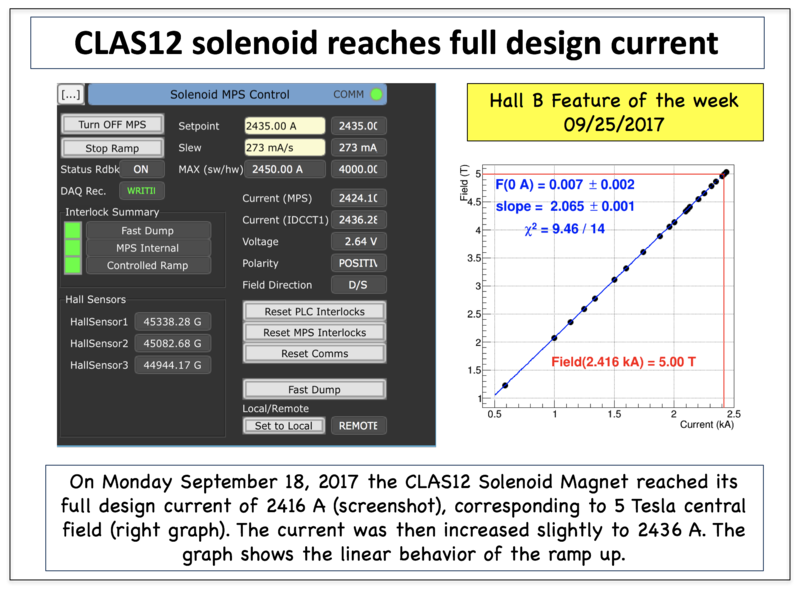 October 9, 2017 - Slide highlighting the successful full current validation test of the CLAS12 solenoid. 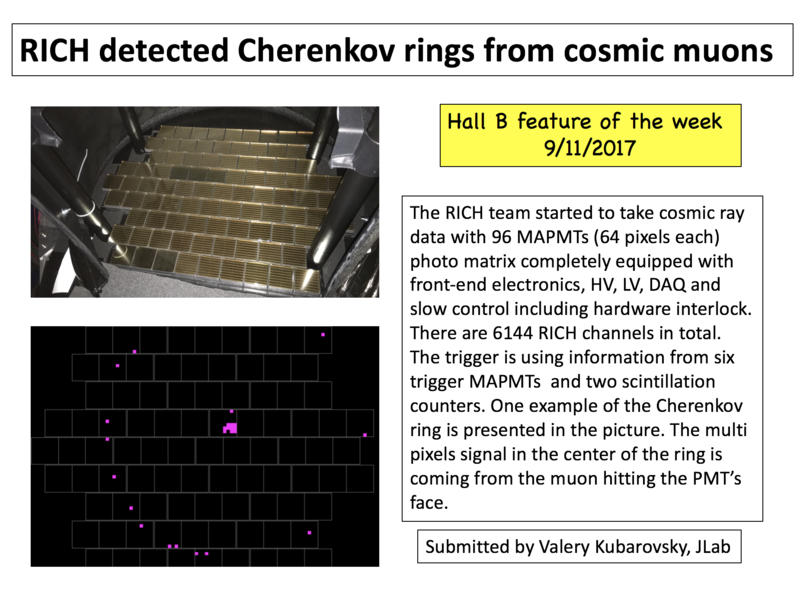 September 11, 2017 - Slide highlighting the recent progress with the RICH detector; now seeing cosmic ray muons with 25% of the full readout. 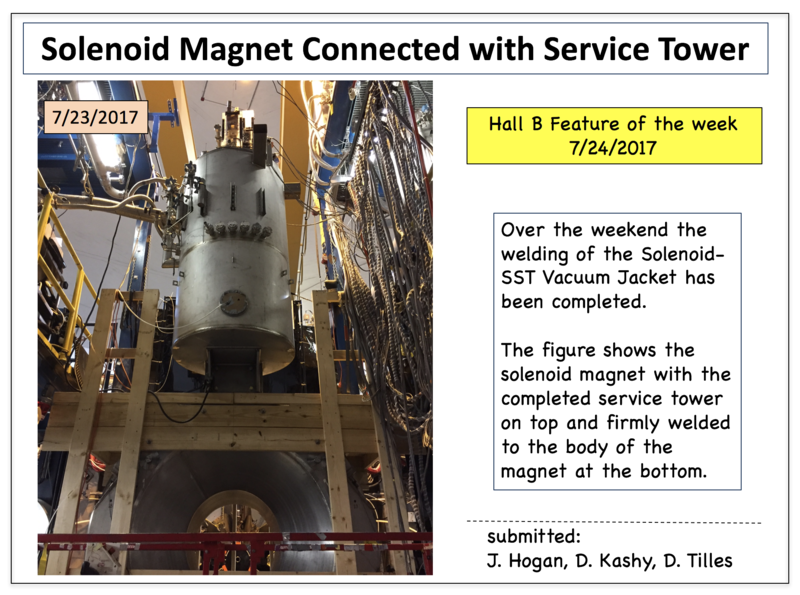 July 24, 2017 - Slide highlighting the ongoing work on the Solenoid magnet and the connection to its cryogenic service tower. 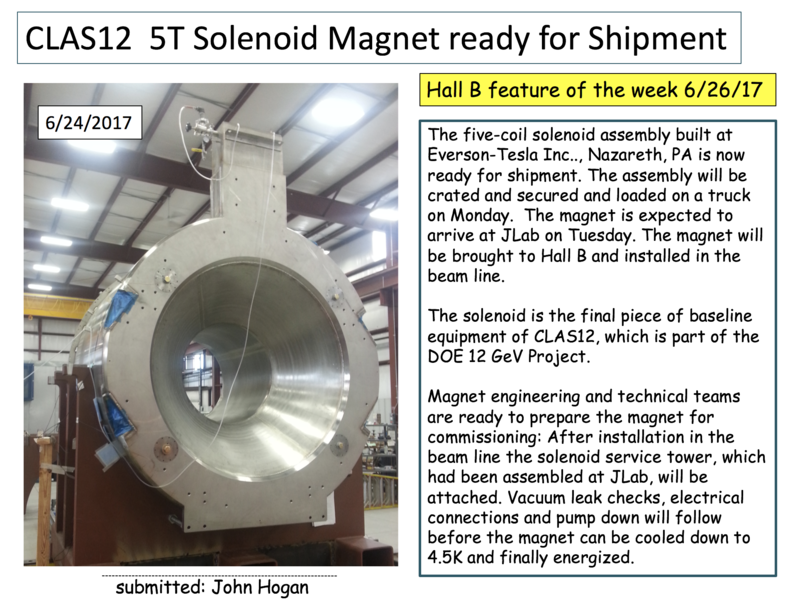 June 26, 2017 - Slide highlighting the CLAS12 superconducting solenoid that is being made ready for shipment to JLab. 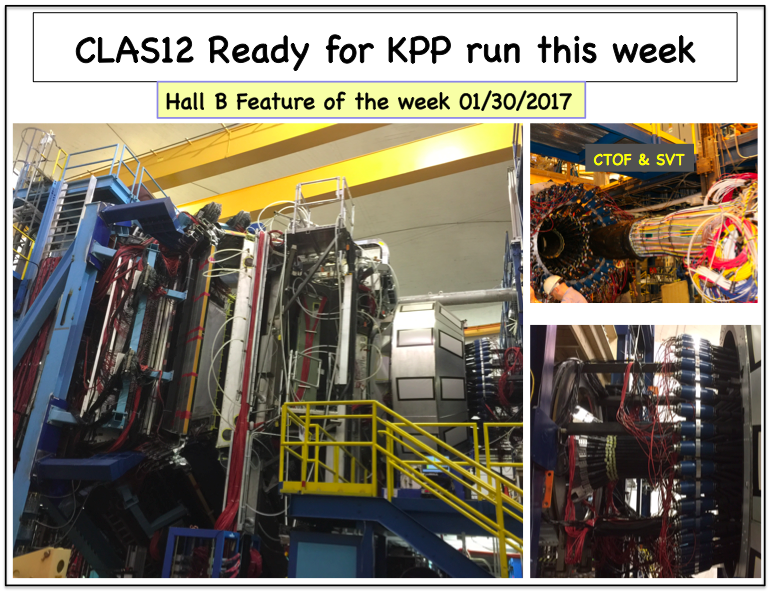 January 30, 2017 - Slide highlighting the completed CLAS12 detector system and beamline for the upcoming KPP beam run. 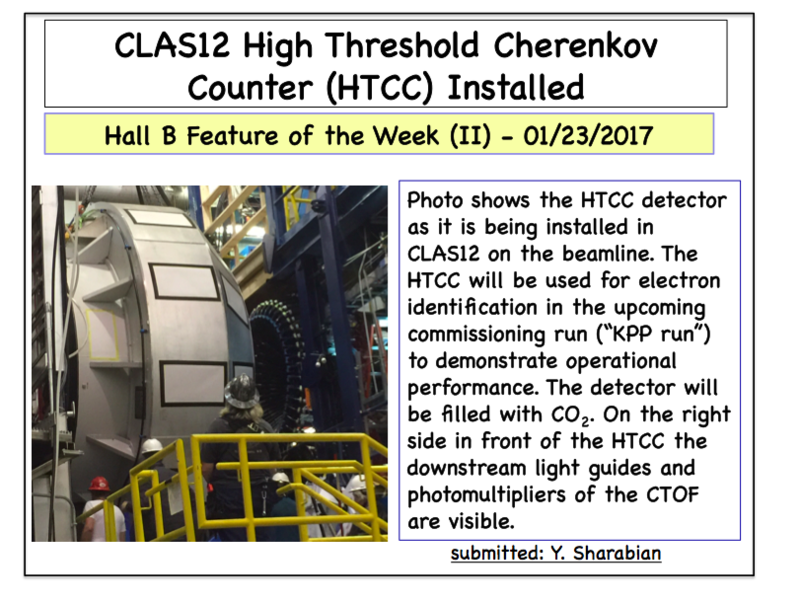 January 23, 2017 - Slide highlighting the installation of the HTCC detector on the subway level in Hall B.
January 23, 2017 - Slide highlighting the installation of the CTOF detector in the solenoid mock-up on the Space Frame in Hall B.
December 5, 2016 - Slide highlighting the progress on the CLAS12 solenoid magnet. 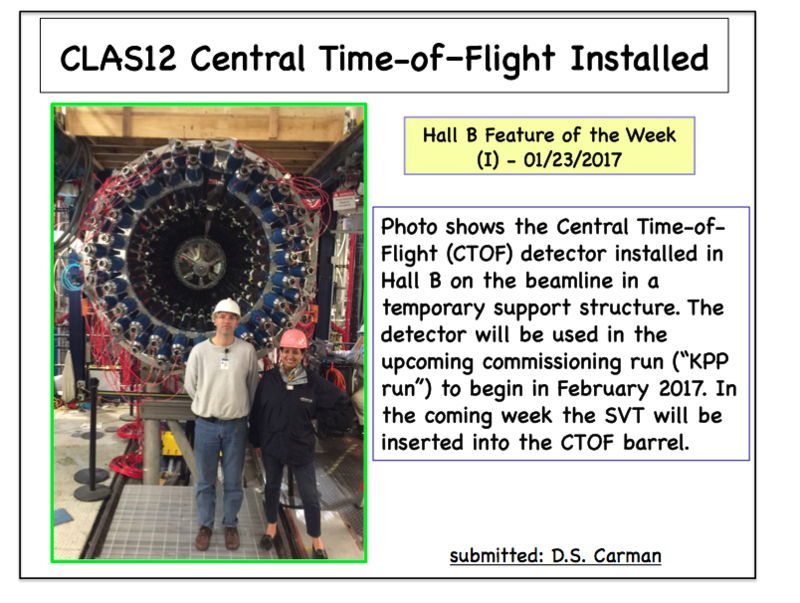 November 14, 2016 - Slide highlighting the installation of the first Region 3 Drift Chamber on the torus. 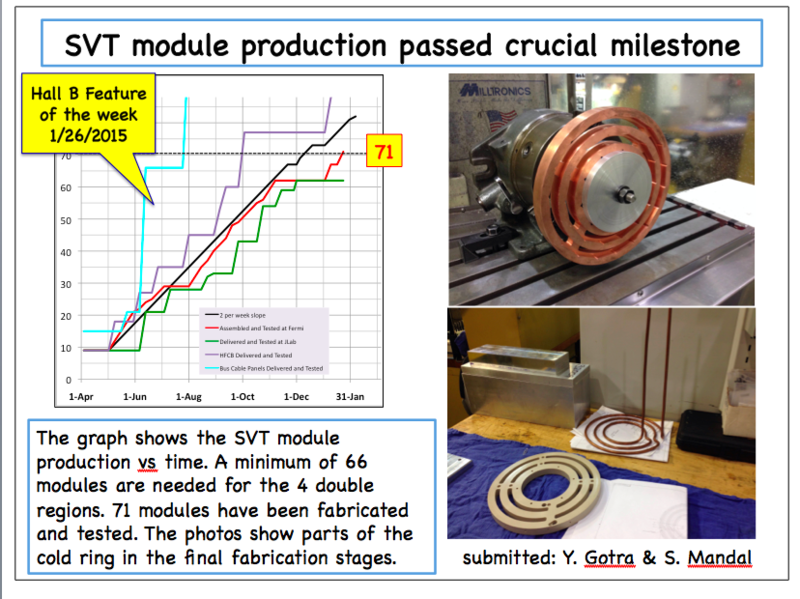 November 7, 2016 - Slide highlighting the critical milestone of the superconducting torus reaching full design current. 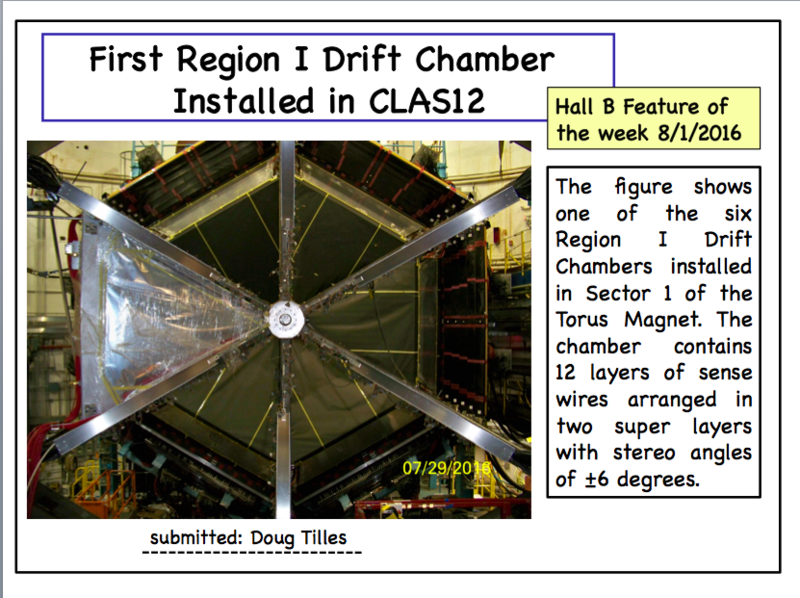 August 29, 2016 - Slide highlighting the ongoing SVT system tests in Hall B.
August 22, 2016 - Slide highlighting the completed installation of the six Region One Drift Chambers on the torus magnet. 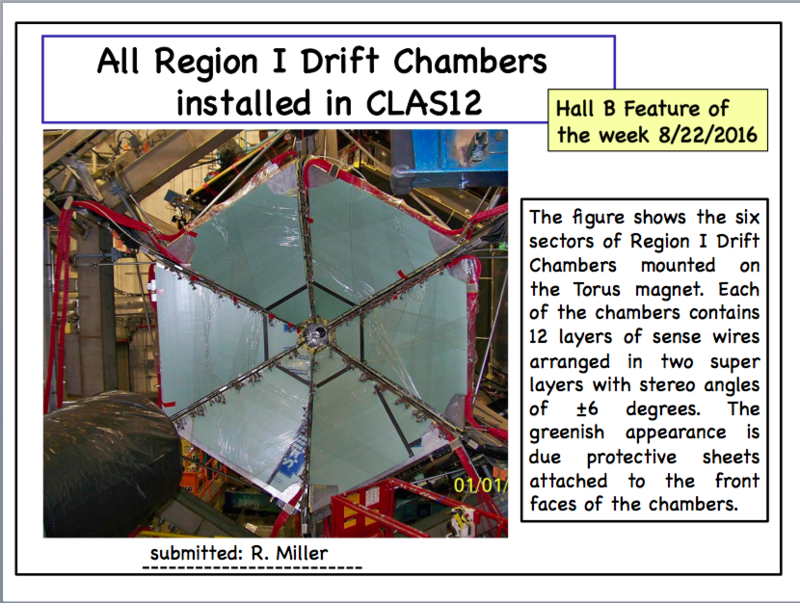 August 1, 2016 - Slide highlighting the newest detector installed in Hall B, Sector 1 of the Region 1 Drift Chamber. 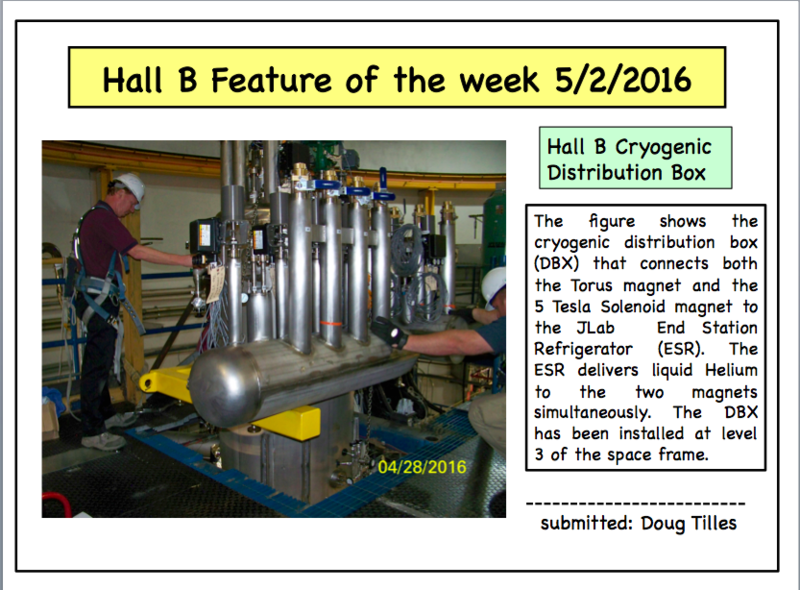 May 2, 2016 - Slide highlighting the Cryogenic Distribution Can that was installed in Hall B last week. 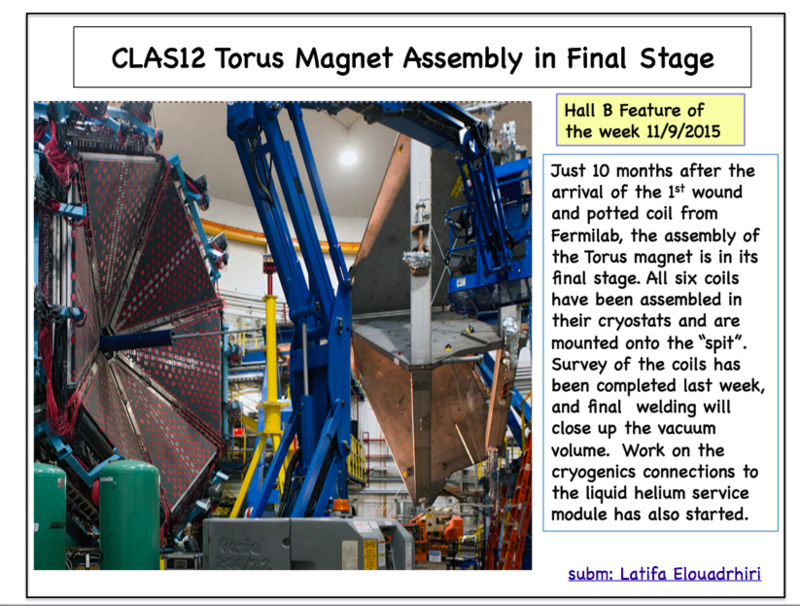 This system serves as the connection for cryogenics between the ESR and the Hall B superconducting magnets (torus and solenoid). 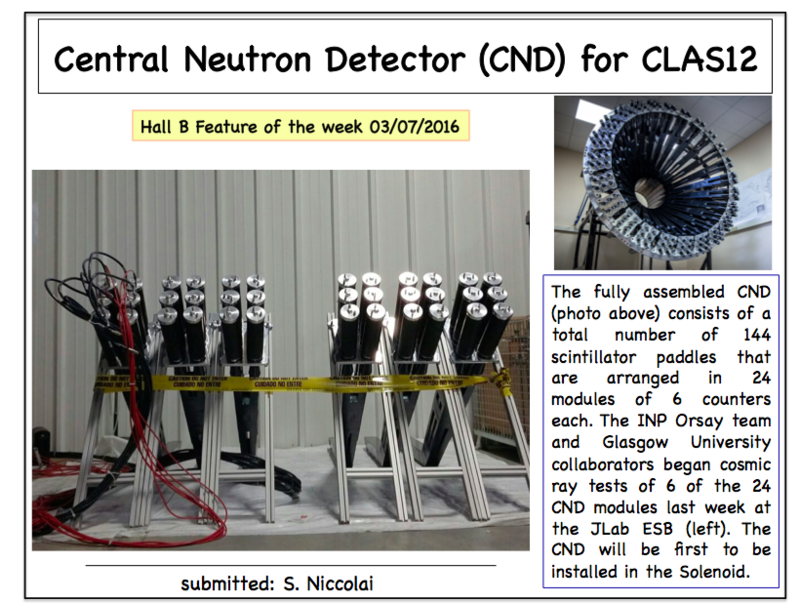 March 7, 2016 - Slide highlighting the Central Neutron Detector (CND) test stand at JLab. 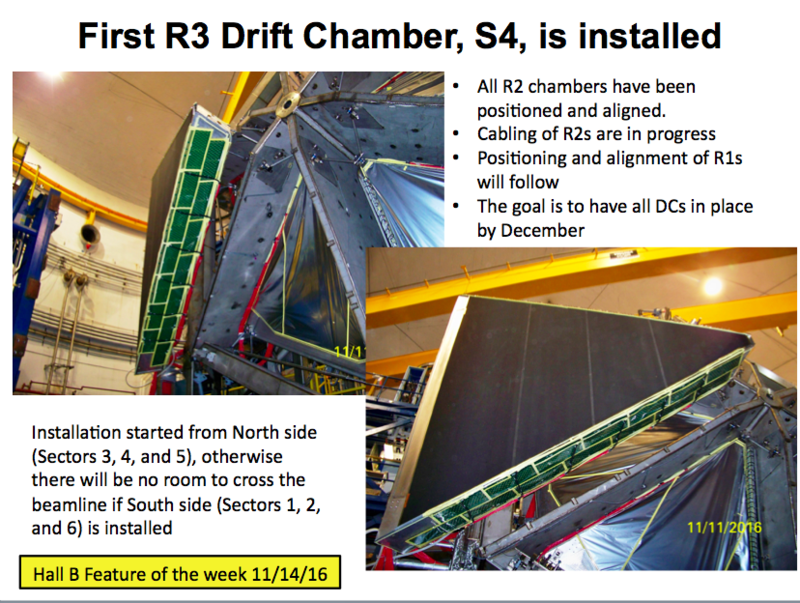 February 29, 2016 - Slide highlighting the completed installation of the six LTCC boxes on the Forward Carriage. 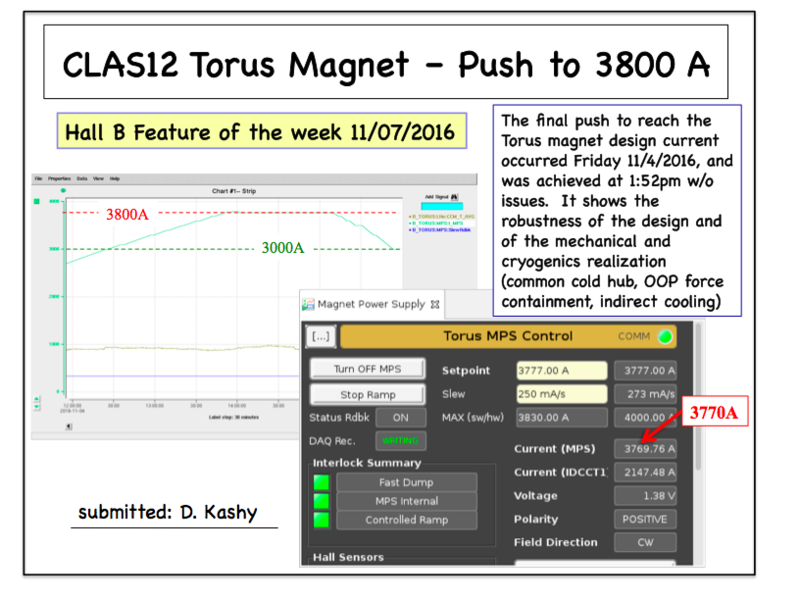 February 1, 2016 - Slide highlighting the significant progress made recently on the torus magnet. 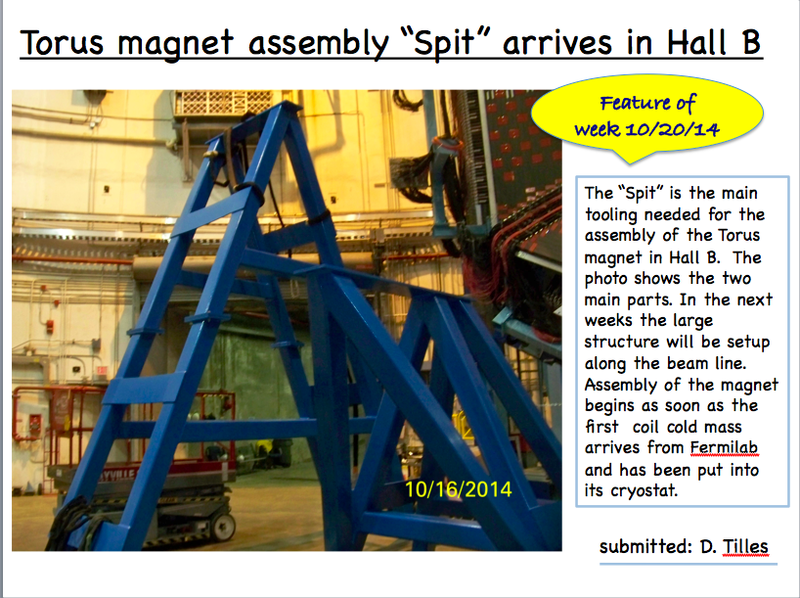 The magnet is now supported on its own legs and the spit assembly has been removed. 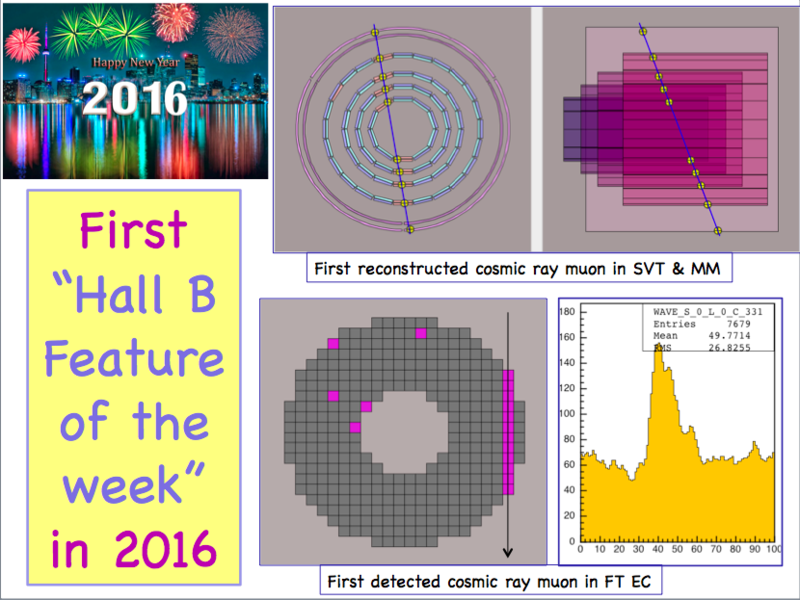 January 4, 2016 - Slide highlighting the significant progress made over the last month with preparing the MM and FT-Cal systems at JLab, showing the response for incident cosmic ray tracks. 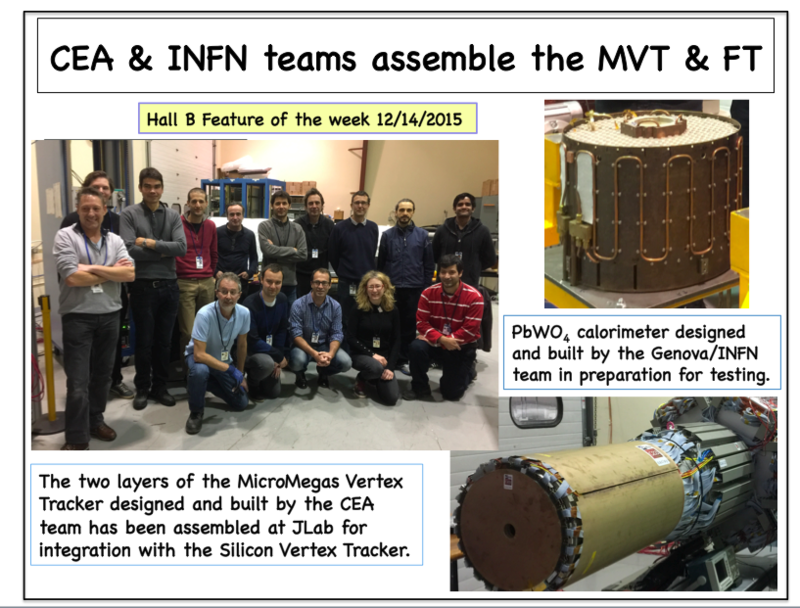 December 14, 2015 - Slide highlighting teams from CEA Saclay and INFN that have come to JLab to work on the Micro-Megas tracker (MVT) and the Forward Tagger (FT) systems. 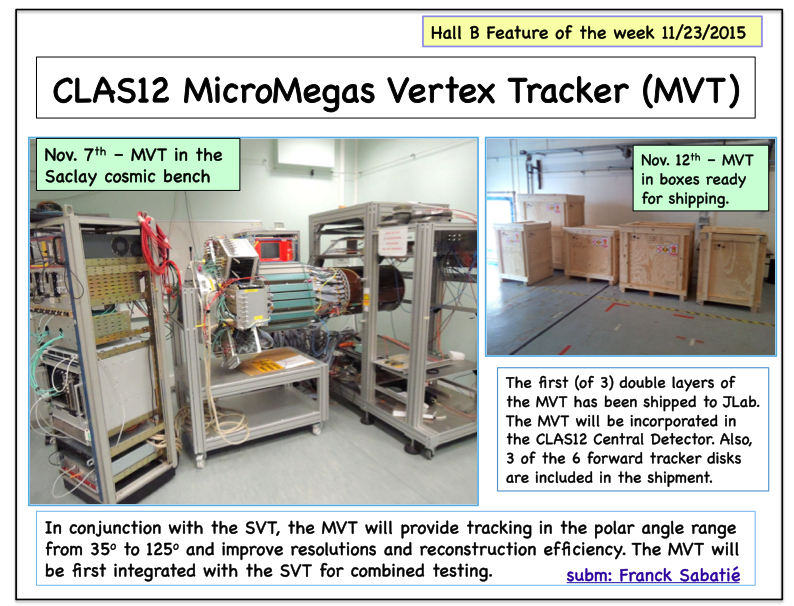 November 23, 2015 - Slide highlighting the progress on the barrel micro-Megas detector that is now being shipped to JLab for testing. 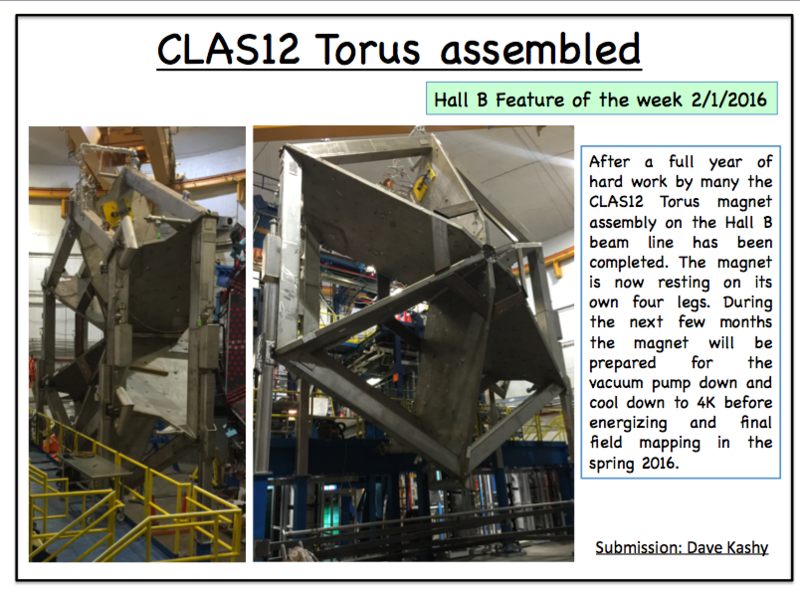 November 9, 2015 - Slide highlighting the progress on the assembly of the torus in Hall B over the past year. 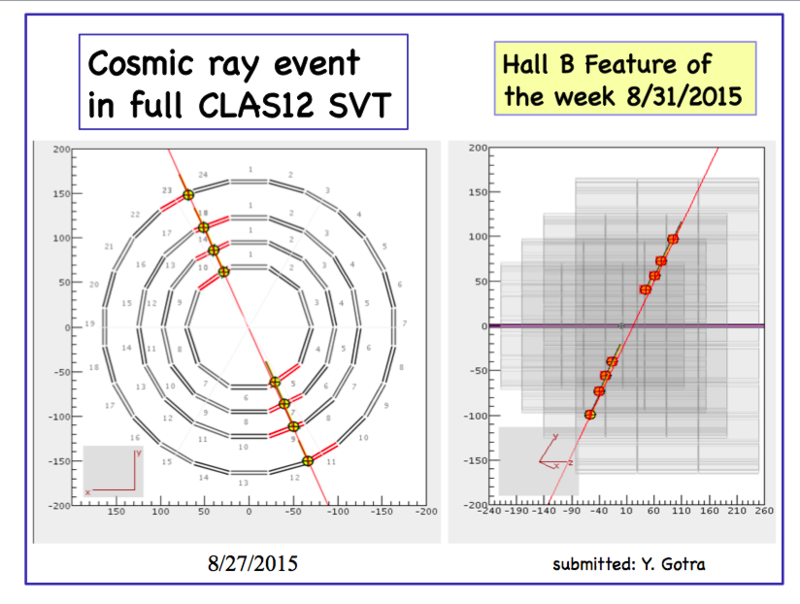 August 31, 2015 - Slide highlighting the successful integration of R1-R4 of the SVT and the start of cosmic rays studies with the complete SVT system. 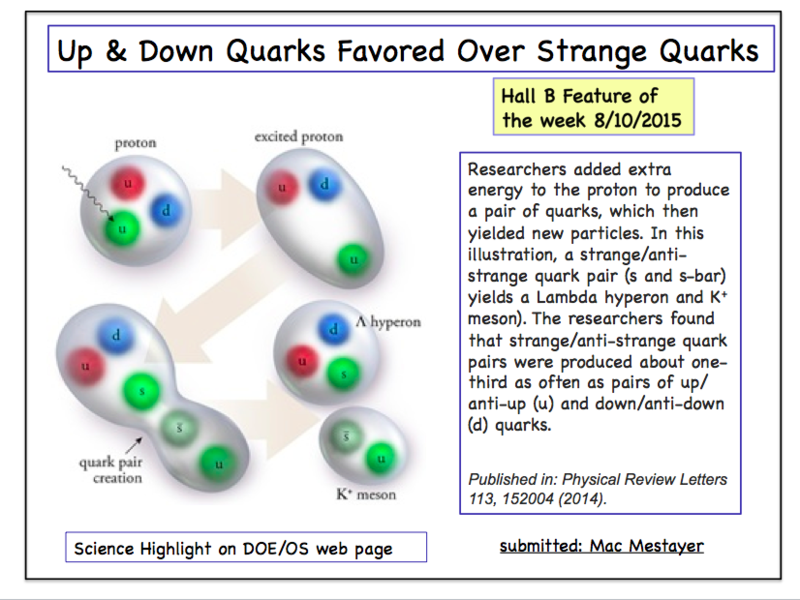 August 10, 2015 - Slide highlighting a "Science Highlight" on the DOE Office of Science web page from our recent CLAS paper probing flavor dependence of quark pair creation in exclusive reactions (M.D. Mestayer et al, PRL 113, 152004 (2014)). 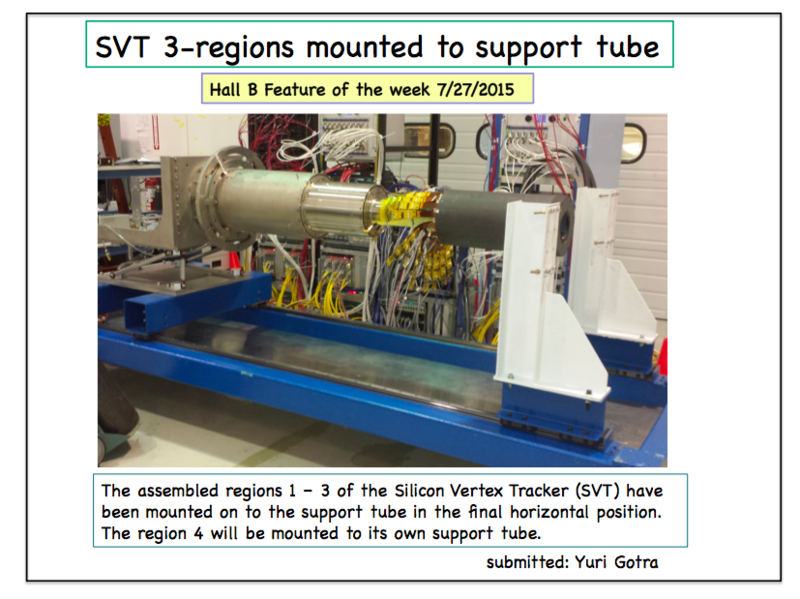 July 27, 2015 - Slide highlighting the mounting of the inner three regions of the SVT onto its associated support tube. 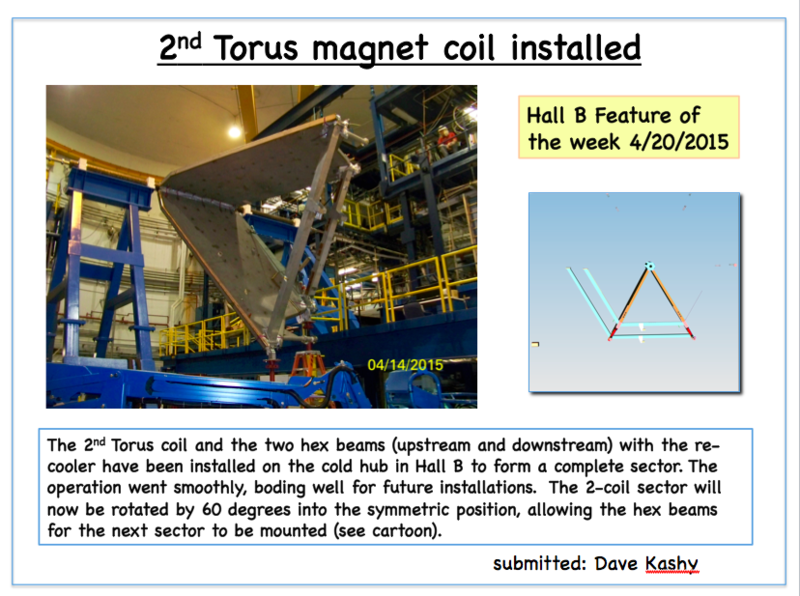 June 29, 2015 - Slide highlighting the installation of the sixth and final torus coil in Hall B.
June 15, 2015 - Slide highlighting the upcoming close-out of the FNAL torus construction project. 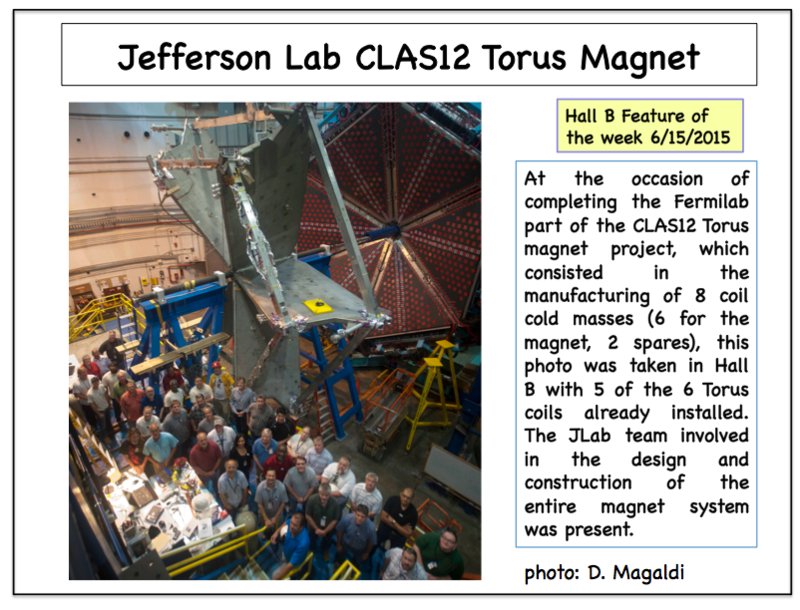 The photograph show the JLab Hall B torus team gathered around the torus in Hall B.
June 8, 2015 - Slide highlighting the successful completion of the SVT assembly of R1 - R3 and R4. 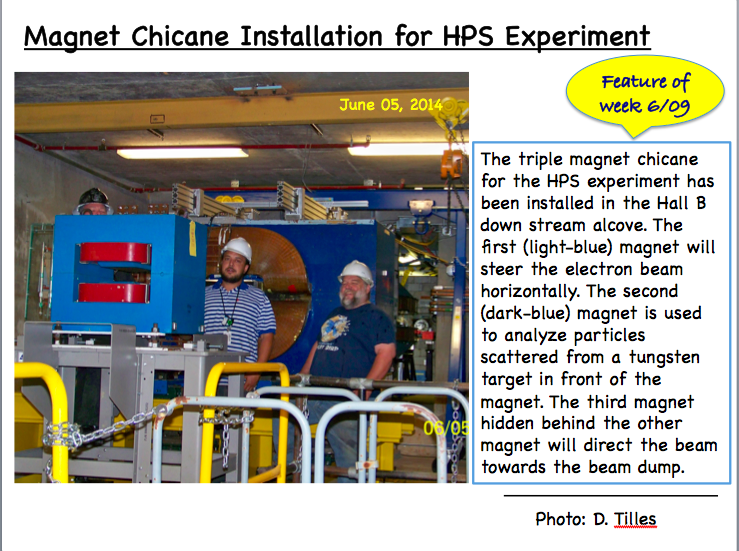 May 18, 2015 - Slide highlighting the successful completion of the spring Heavy Photon Search (HPS) completion. 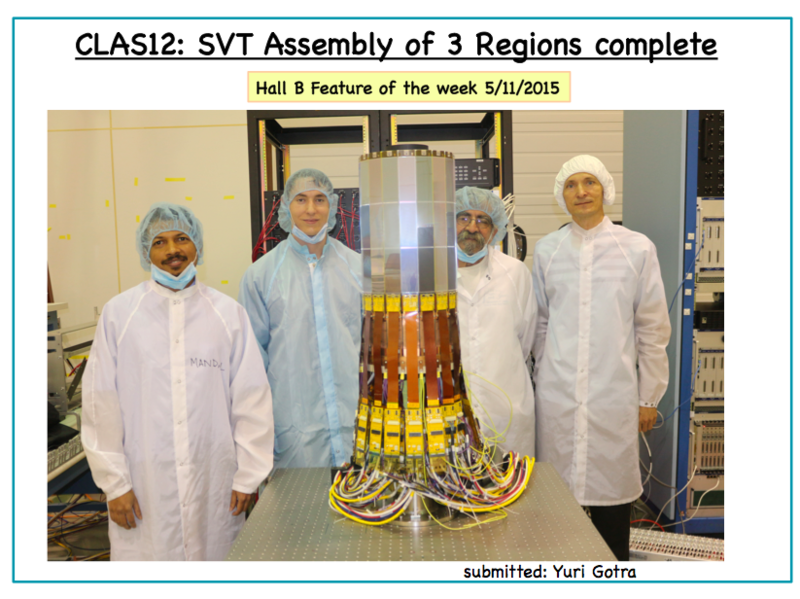 May 11, 2015 - Slide highlighting the completed R1, R2, and R3 SVT assembly and the work crew. 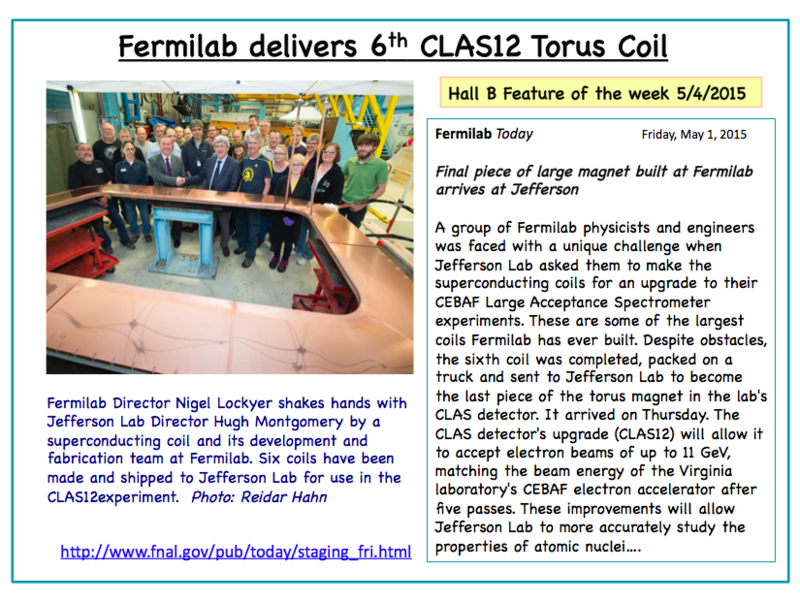 May 4, 2015 - Slide highlighting the delivery of the sixth production torus coil from Fermilab. 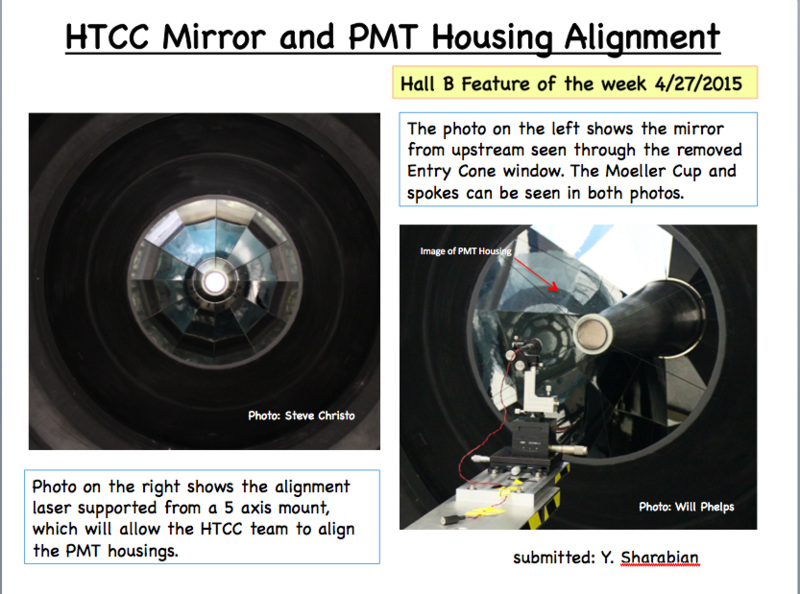 April 27, 2015 - Slide highlighting the mirror and PMT alignment work in progress for the HTCC. 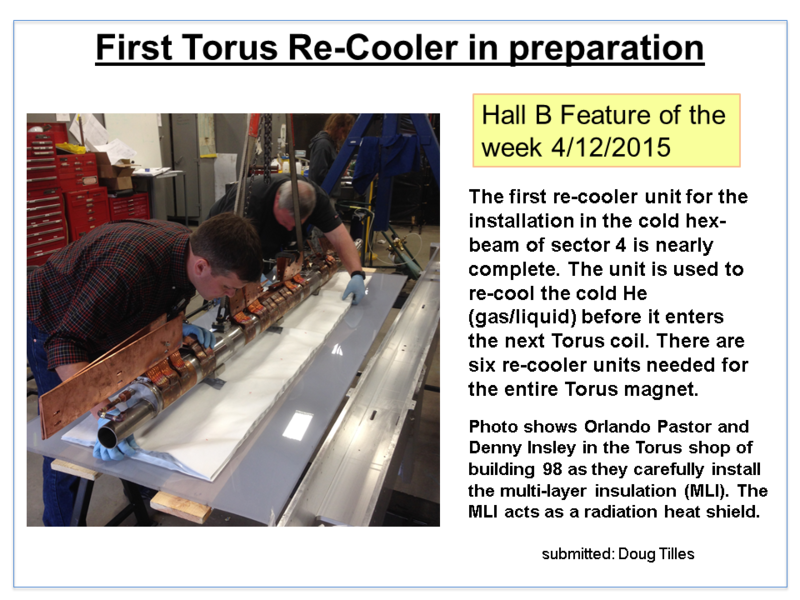 April 20, 2015 - Slide highlighting the installation of the second torus coil on the installation spit in Hall B.
April 13, 2015 - Slide highlighting workers preparing the first torus magnet recooler. 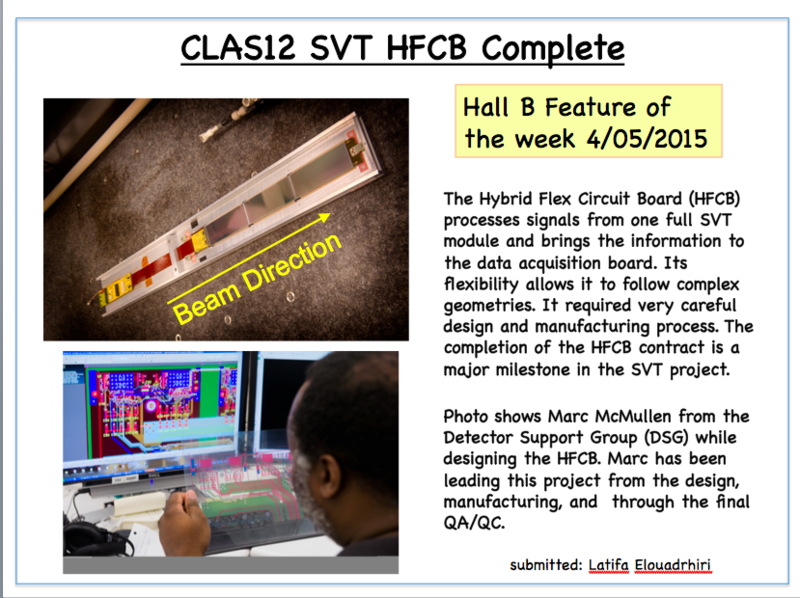 April 6, 2015 - Slide highlighting the completion of the HFCB (high flex circuit boards) for the SVT detector. 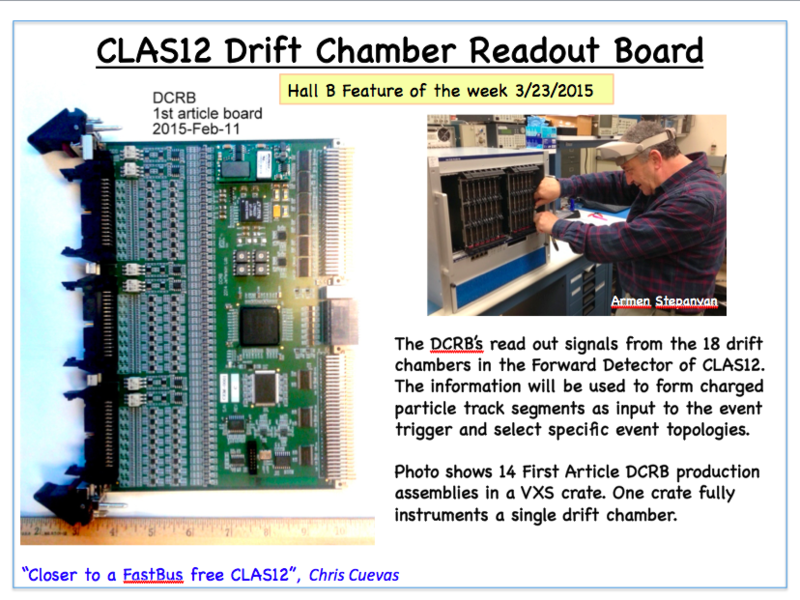 March 23, 2015 - Slide highlighting the new Drift Chamber Readout Board (DCRB). The 14 first article boards have been tested (enough for a full crate - one DC sector). The remainder of the boards (totaling roughly 250) will be delivered by the end of the year. 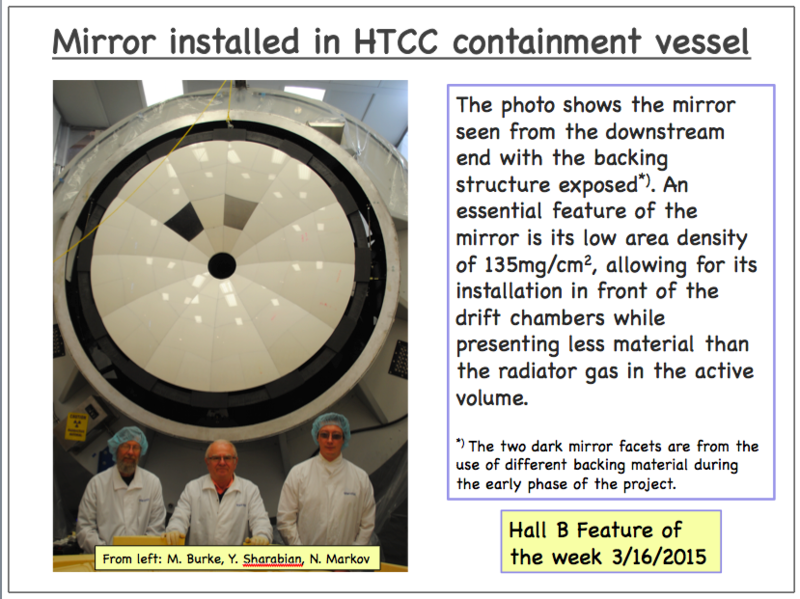 March 16, 2015 - Photograph of the HTCC mirror assembly installed in the Containment Vessel. 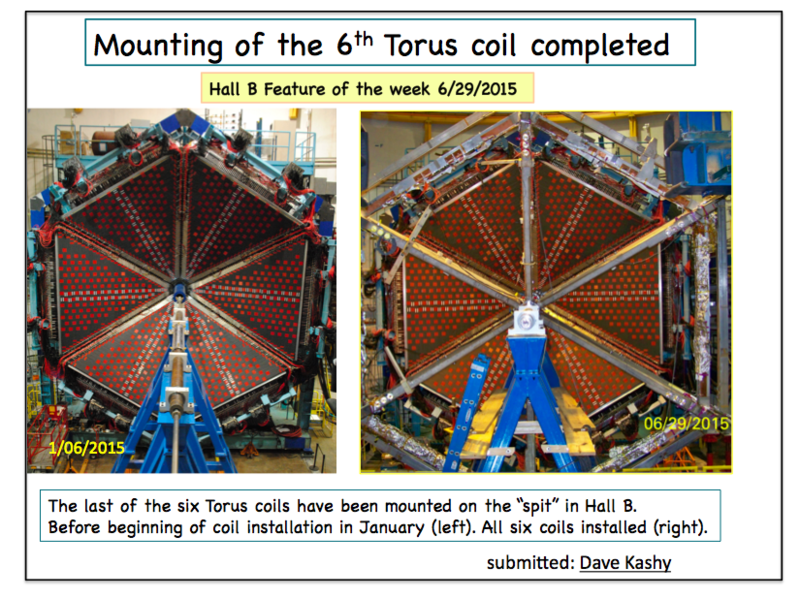 March 9, 2015 - Photograph of the first torus coil installed in Hall B on the installation spit. 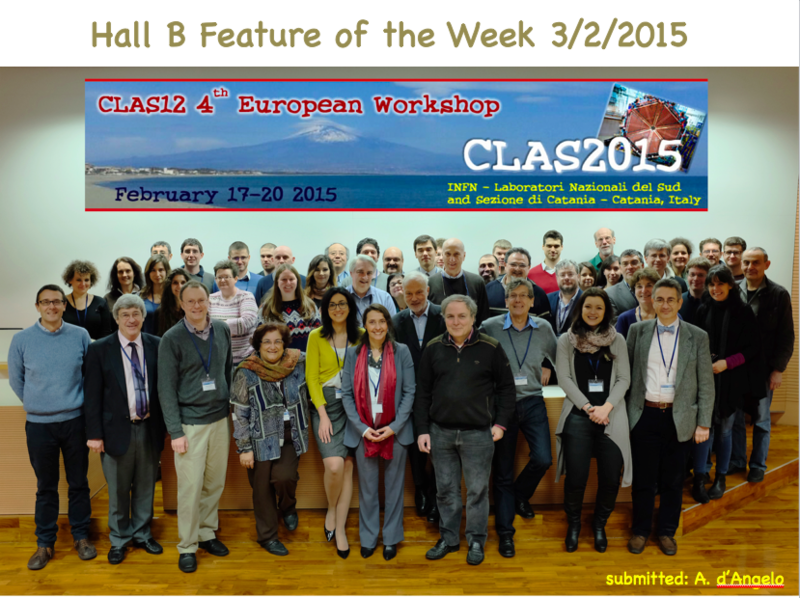 March 2, 2015 - Photograph of the participants at the recent CLAS12 European Workshop in Catania, Italy. 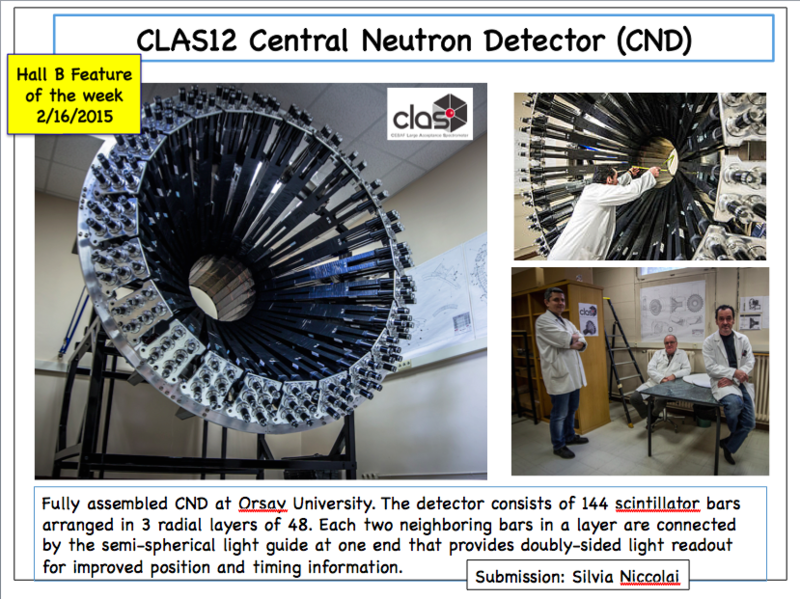 February 16, 2015 - Slide showing the fully completed and tested Central Neutron Detector for CLAS12 in its solenoid mockup. 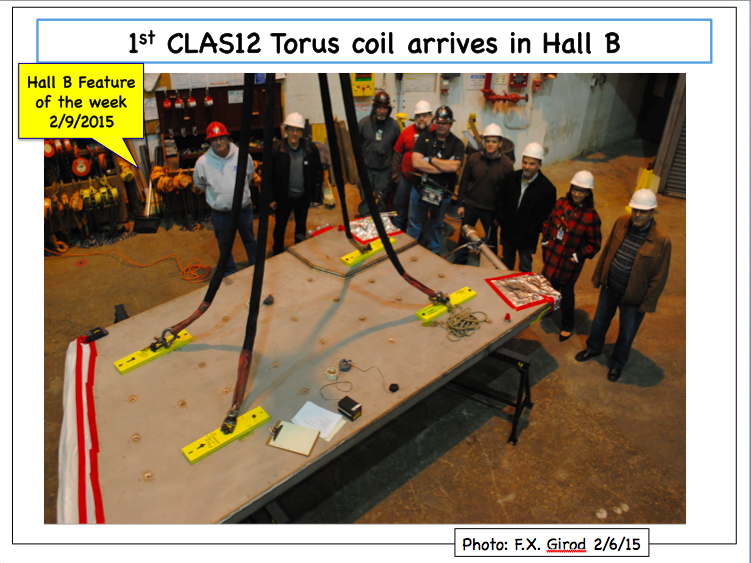 February 9, 2015 - Slide showing the first production torus coil delivery to Hall B last week. 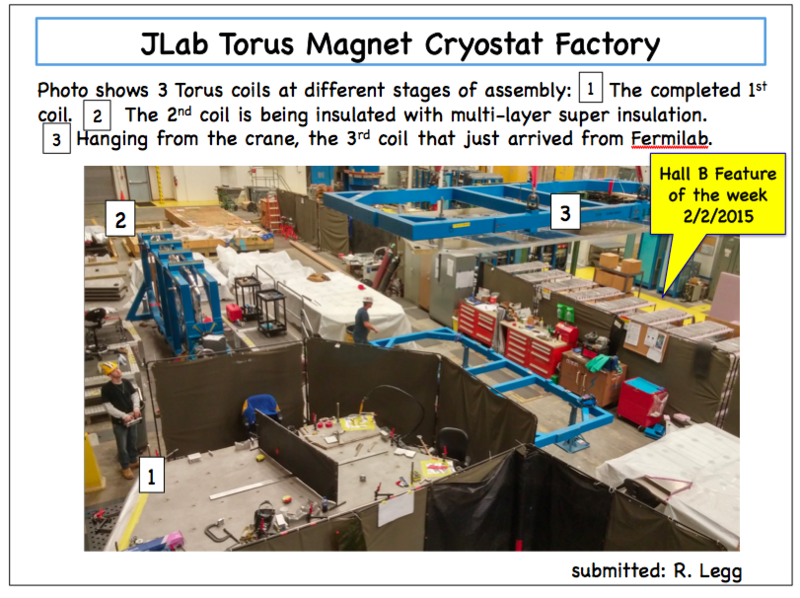 February 2, 2015 - Slide highlighting the layout of the JLab Torus Cryostat Factory and the different stations into which the three production coils are located. 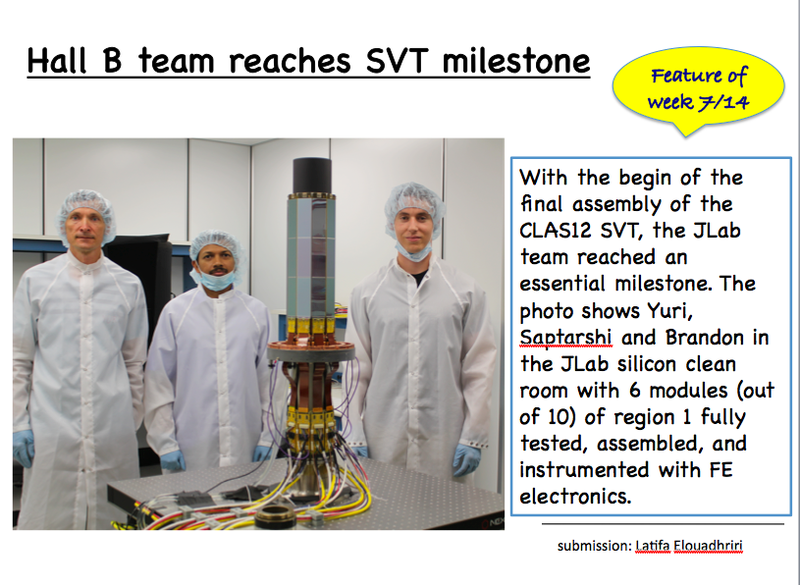 January 26, 2015 - Slide highlighting the important milestone achieved for module completion for the assembly of SVT R1, R2, R3, and R4 at Fermilab. 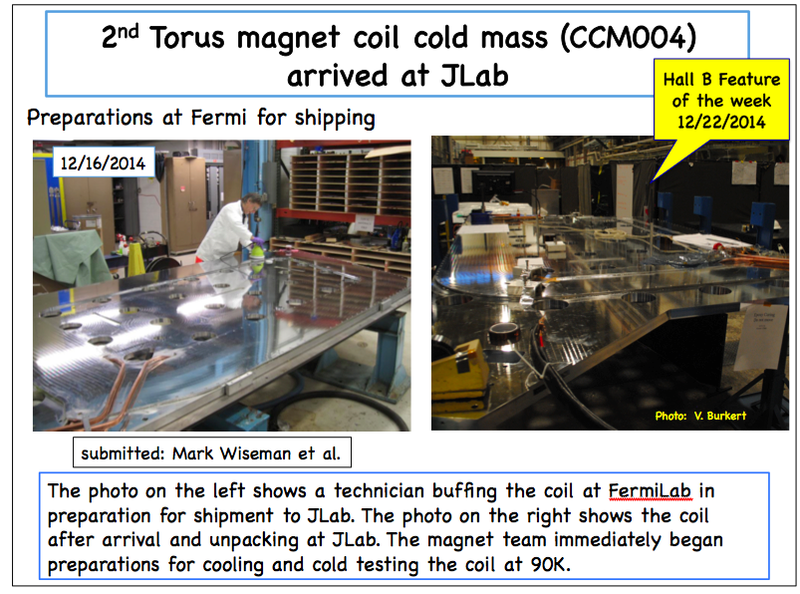 December 22, 2014 - Slide highlighting the delivery of the second production torus coil to JLab. 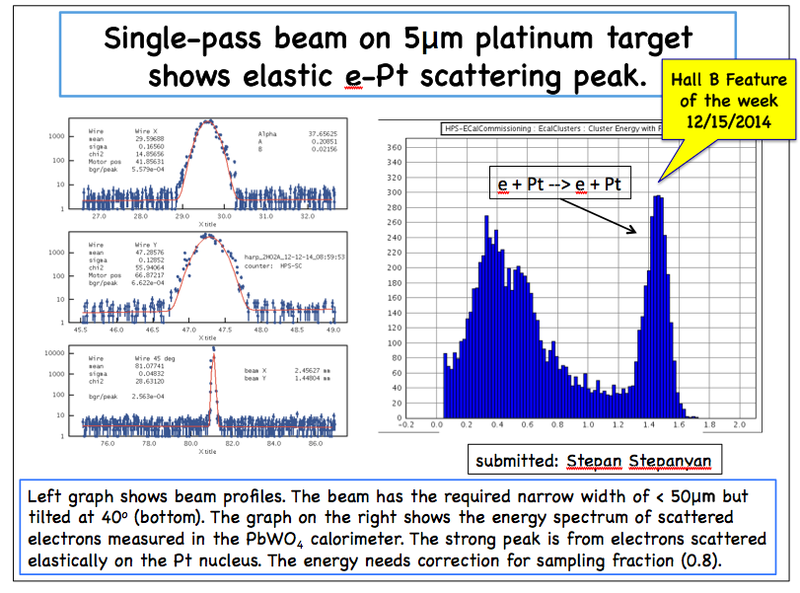 December 15, 2014 - Slide highlighting single pass beam to the HPS experiment on a 5 micron Platinum target and elastic events in the HPS calorimeter. 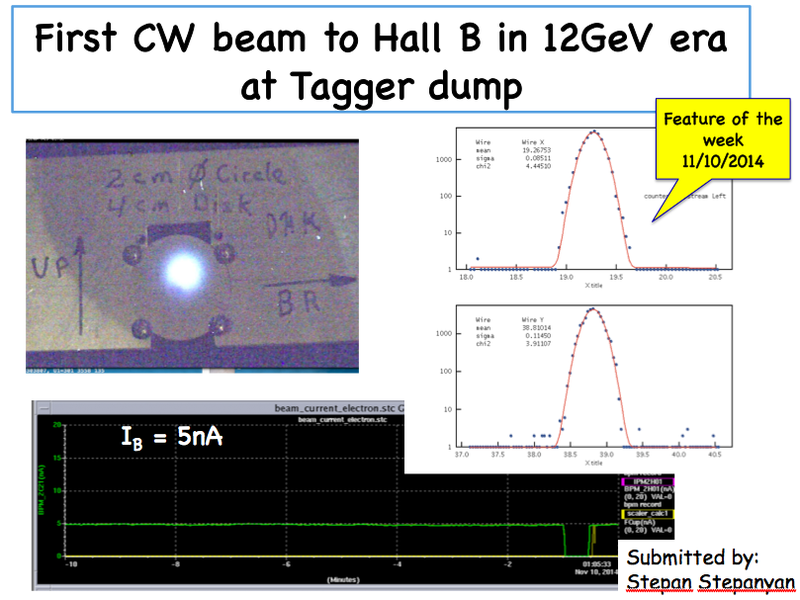 December 8, 2014 - Slide highlighting the first beam delivery in the 12 GeV era through Hall B to the Faraday cup and beam dump in the downstream alcove. 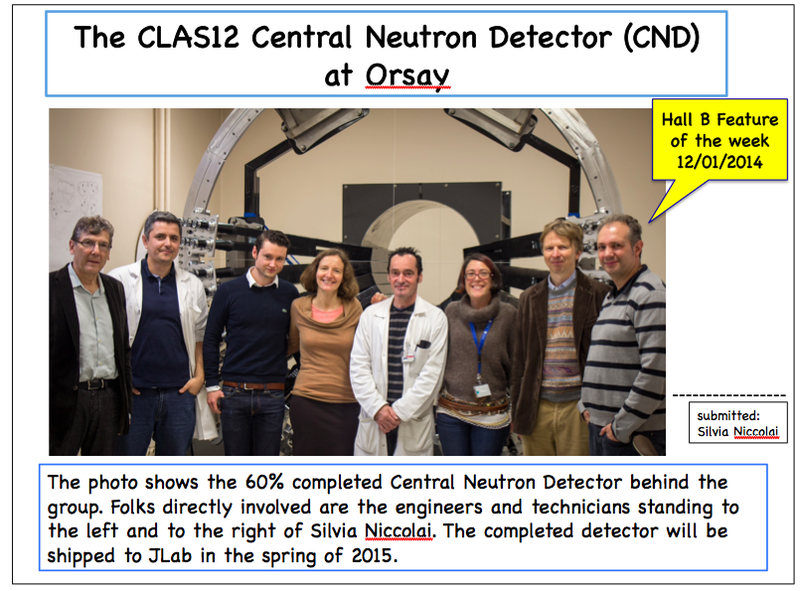 December 1, 2014 - Photograph of the Central Neutron Detector (CND) team at Orsay headed by Silvia Niccolai. 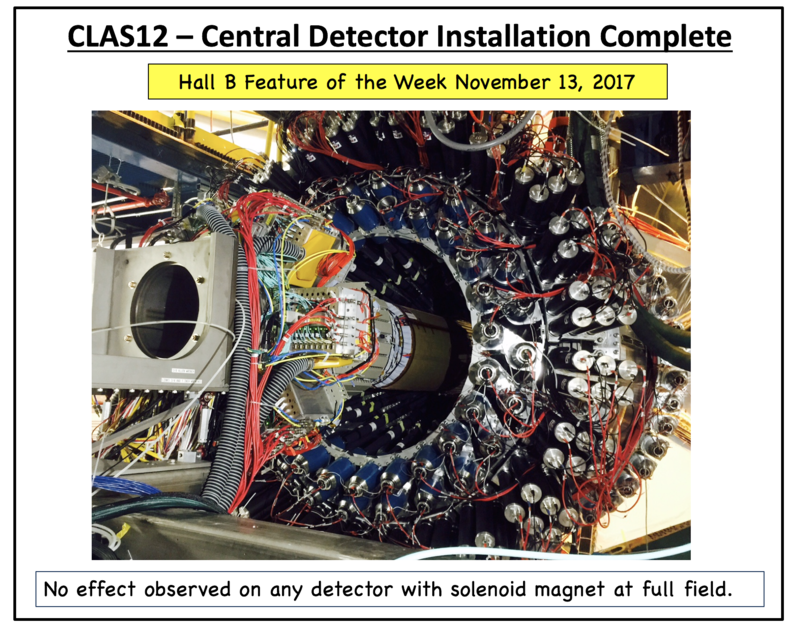 In the background of the photograph are the production CND modules being installed in a mock-up of the installation fixture and solenoid. 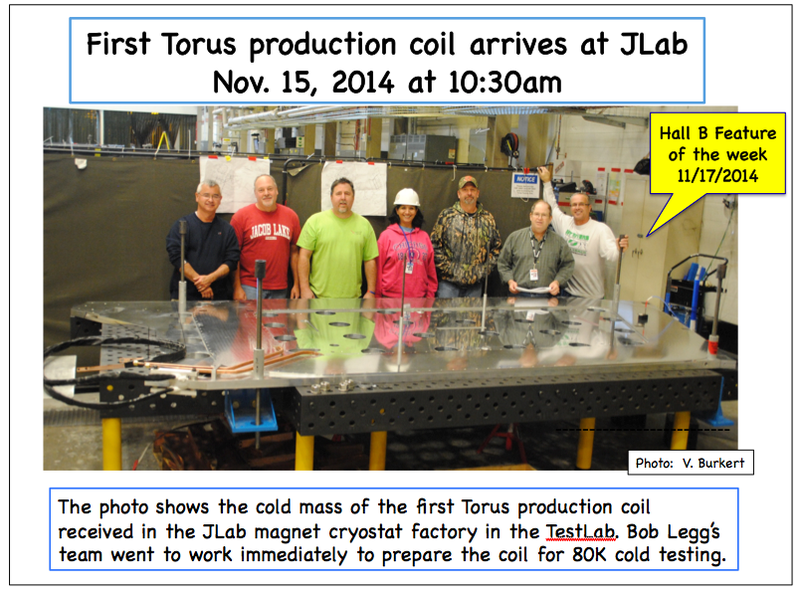 November 17, 2014 - Photograph of the first torus production coil delivered to JLab on November 15. 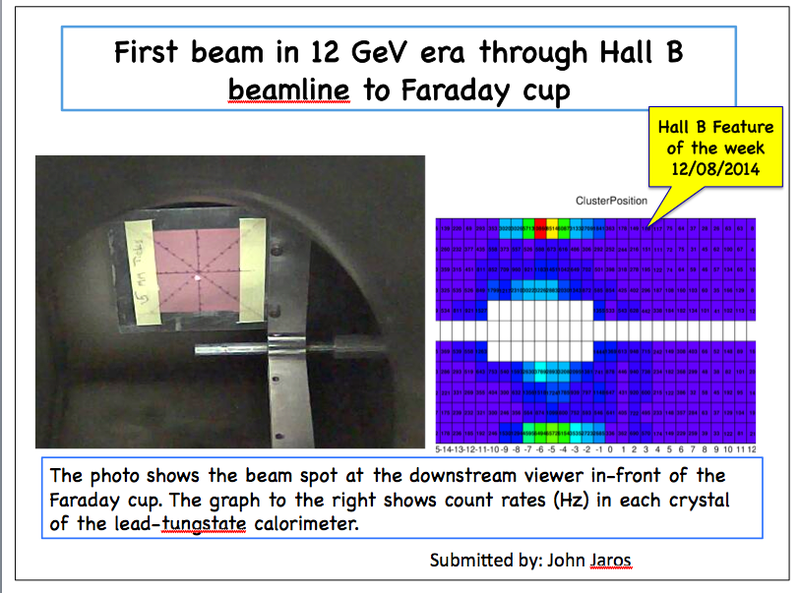 Noting the first beam delivery to Hall B in 30 months during the recent commissioning of the upstream beamline. 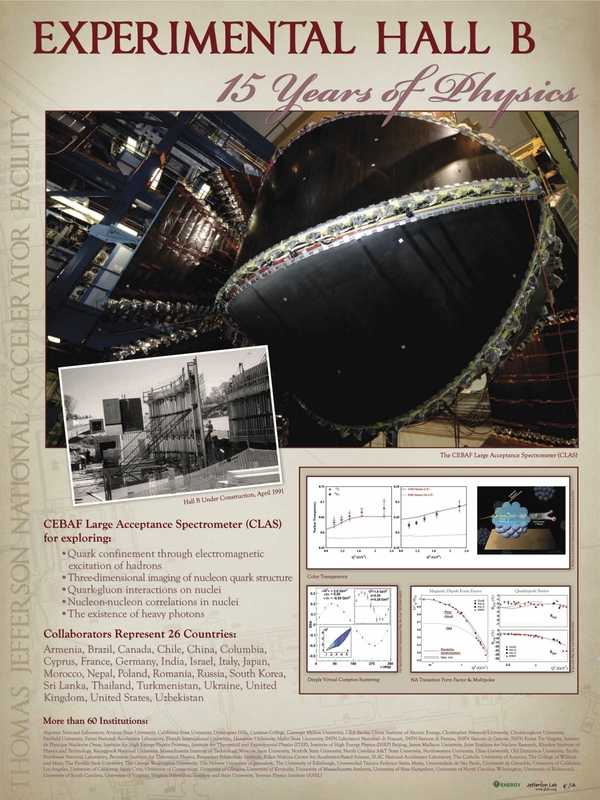 Highlight of the significant development work related to the simulation of the CLAS12 detector. 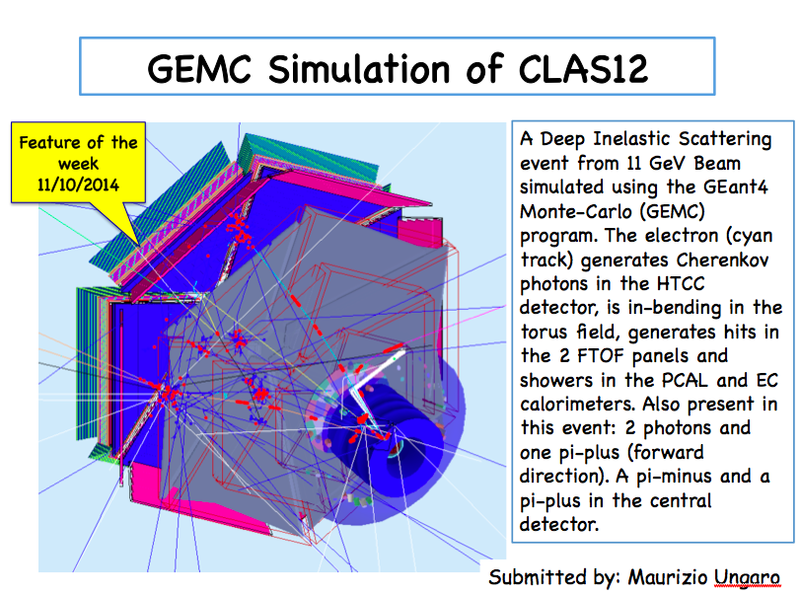 The GSIM code suite is a GEANT-4 model of the CLAS12 detector developed by Maurizio Ungaro. 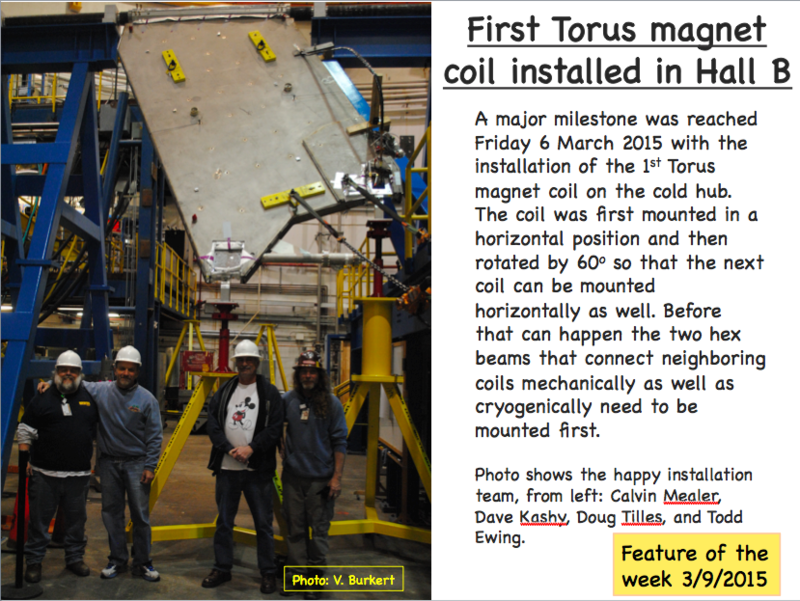 November 3, 2014 - Photograph of the first torus production coil just before its second epoxy impregnation procedure. 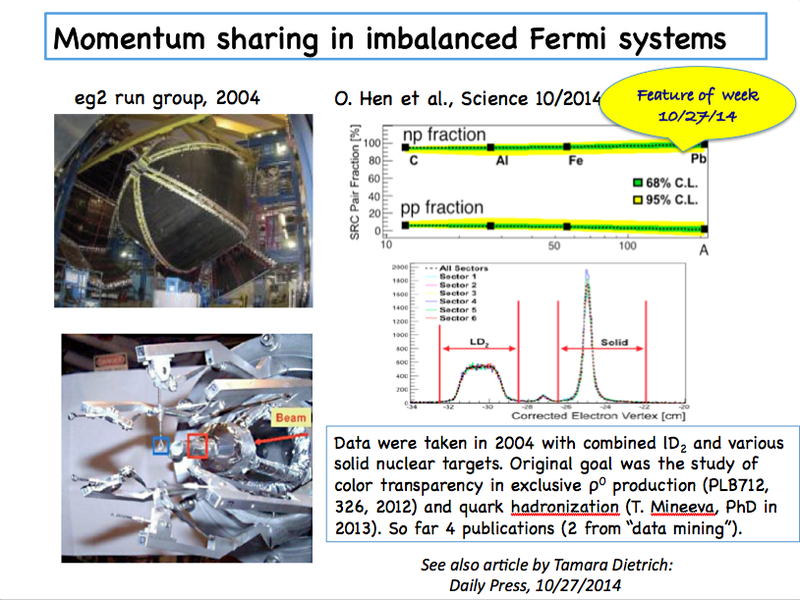 October 27, 2014 - Overview of a new CLAS Collaboration paper that will be published in the journal Science on Momentum Sharing in Imbalanced Fermi Systems. 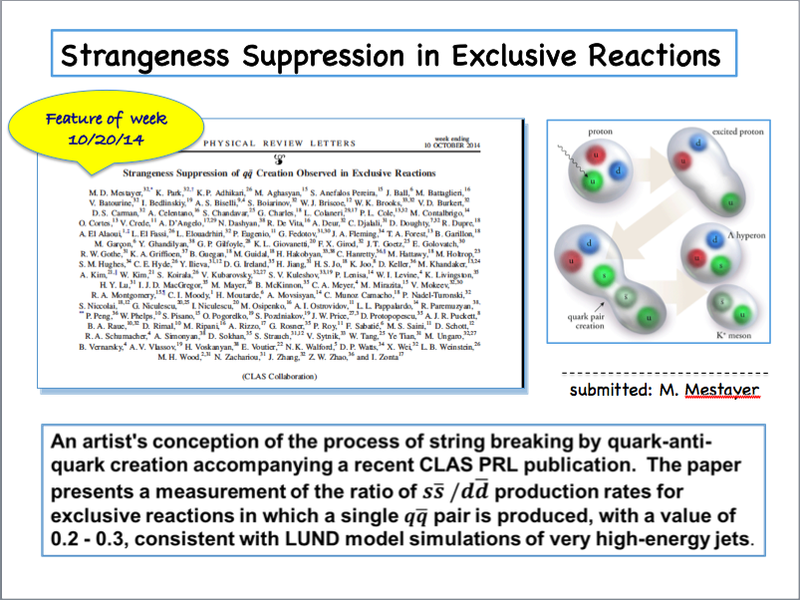 A new CLAS paper in the journal Physical Review Letters has been selected as an Editor's choice on strangeness suppression in exclusive reactions. 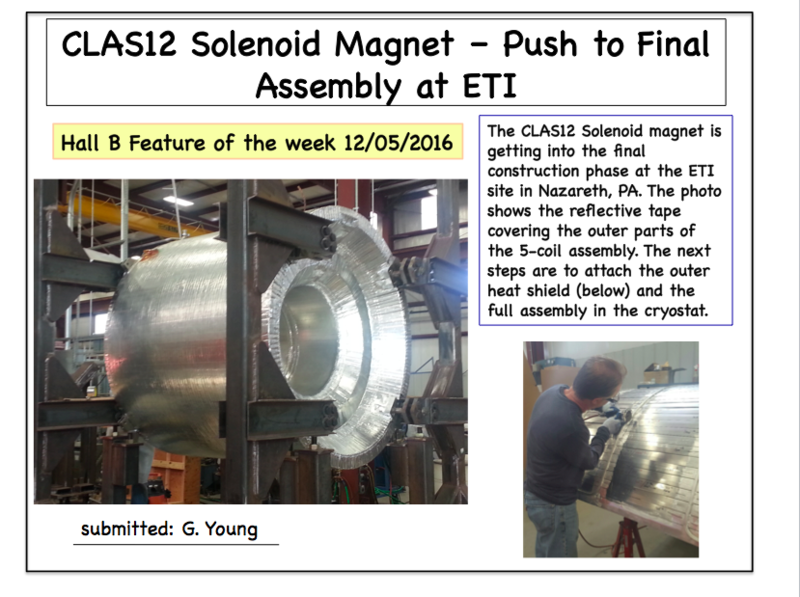 Photograph showing the steel work for the assembly spit for the new CLAS12 torus magnet. 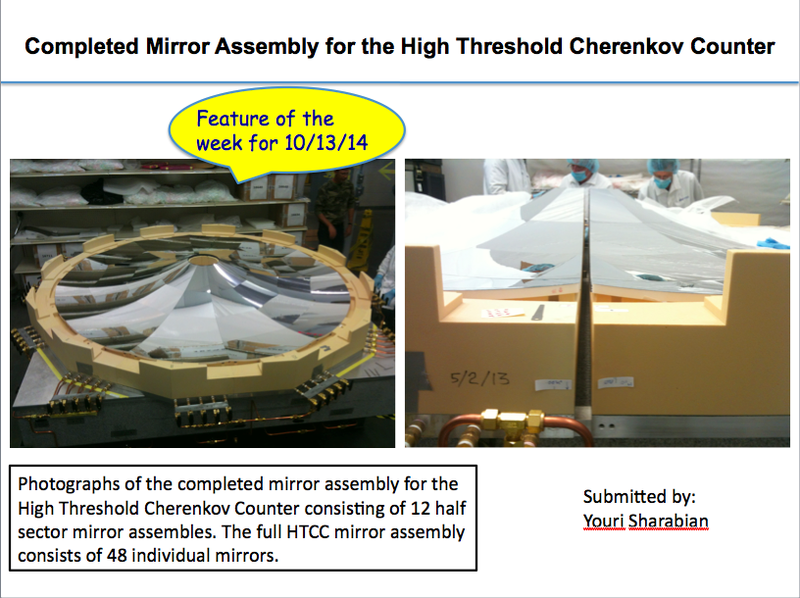 October 13, 2014 - Photograph showing the completed full mirror assembly for the HTCC. 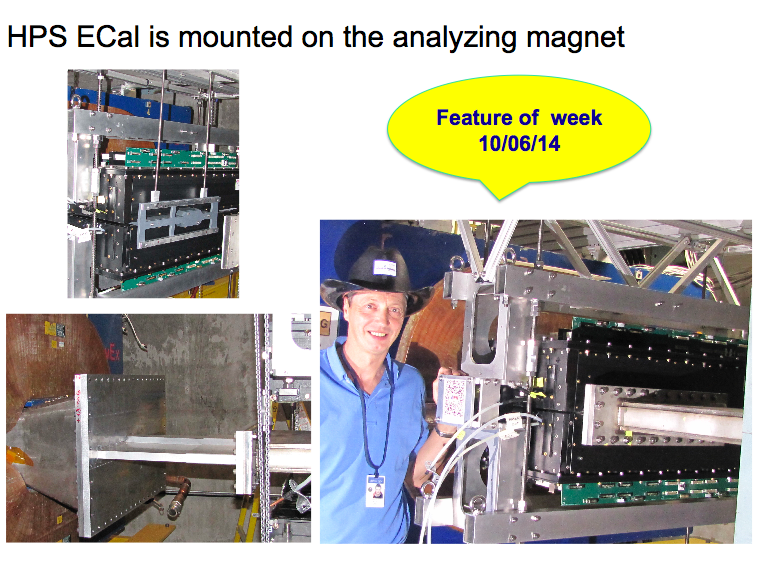 October 6, 2014 - Photograph showing the HPS calorimeter installed in the analyzing magnet in the HPS beamline. 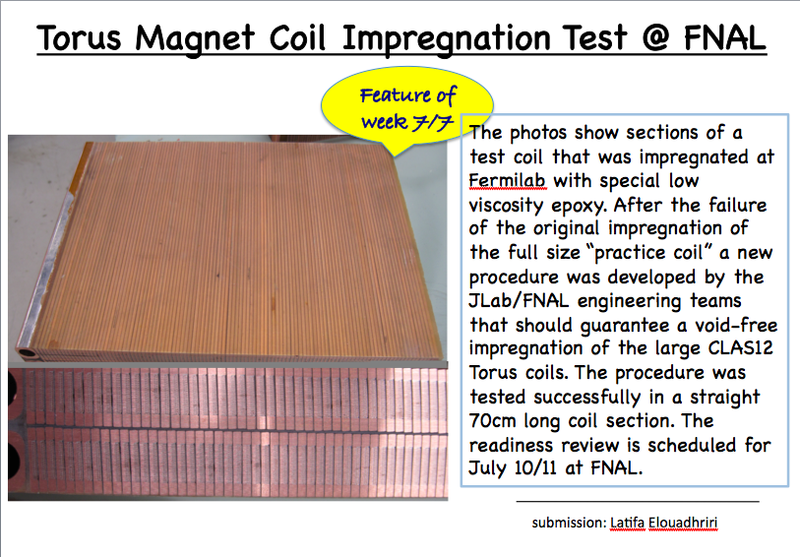 September 29, 2014 - Photograph showing the completed solenoid prototype coil at the magnet vendor. 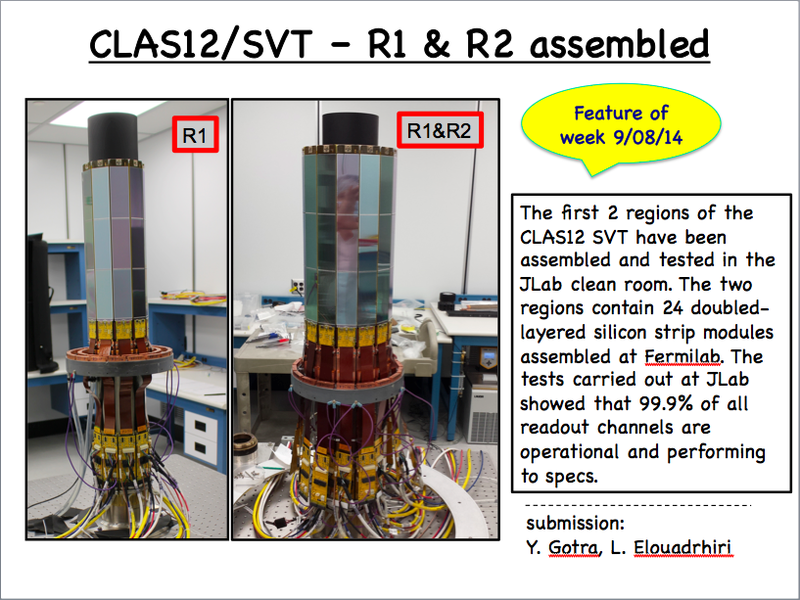 September 8, 2014 - Photograph showing the completed Region 2 layer of the SVT detector. 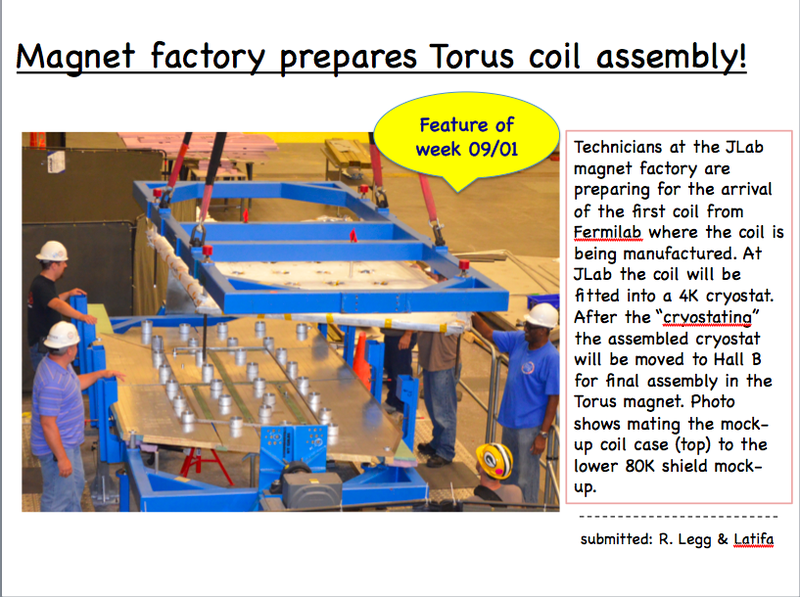 September 1, 2014 - Photograph showing workers preparing the magnet factory at JLab for a torus coil assembly. 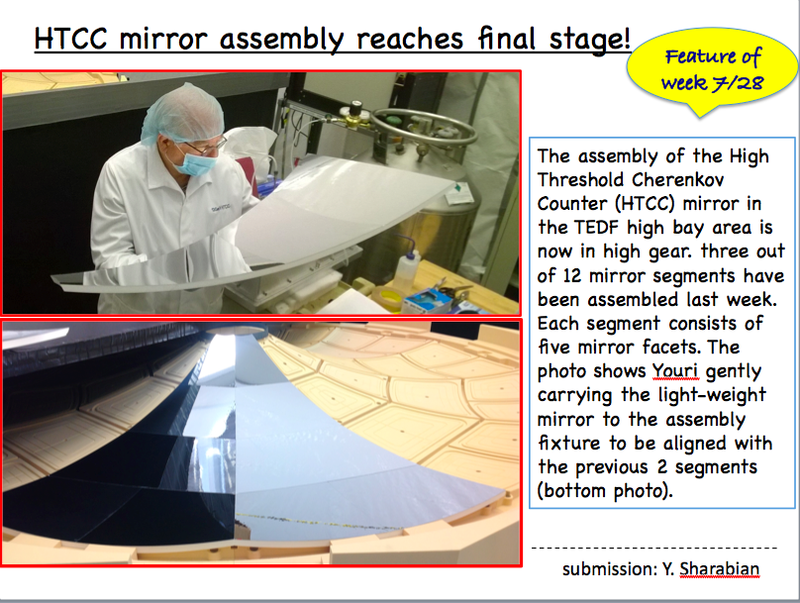 August 25, 2014 - Photograph of a dry fit of the completed HTCC half-sector mirror assemblies on the large vacuum table in the HTCC cleanroom. 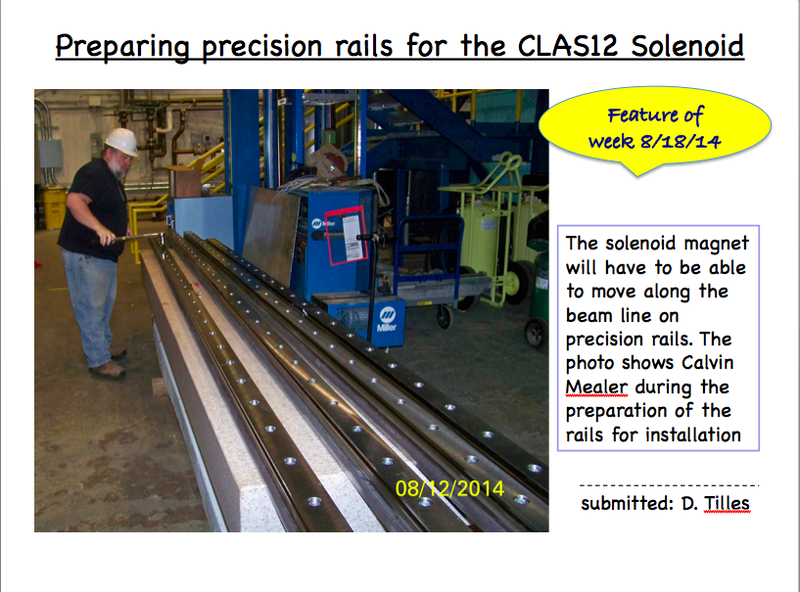 August 18, 2014 - Photograph of the work to prepare the rails that were installed on the Subway level in Hall B to support the superconducting solenoid magnet. 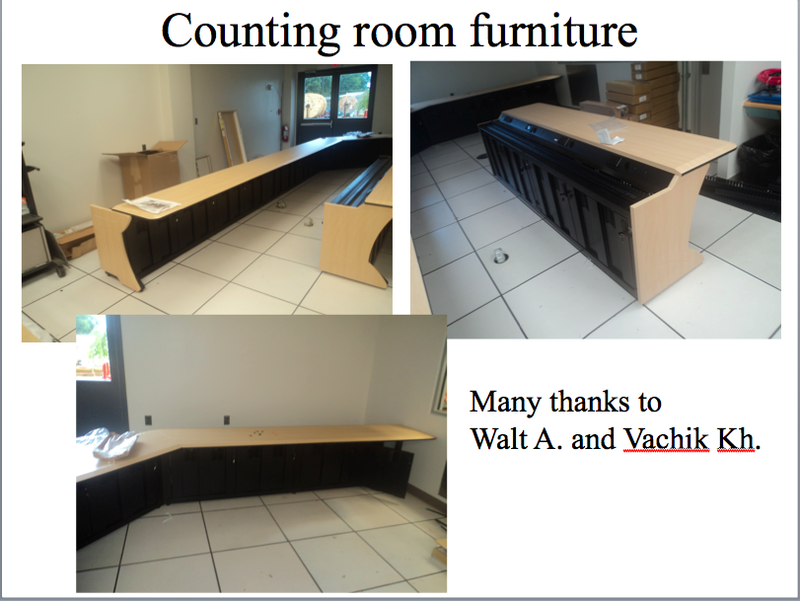 August 4, 2014 - Photograph of the newly delivered furniture for the Hall B Counting House. 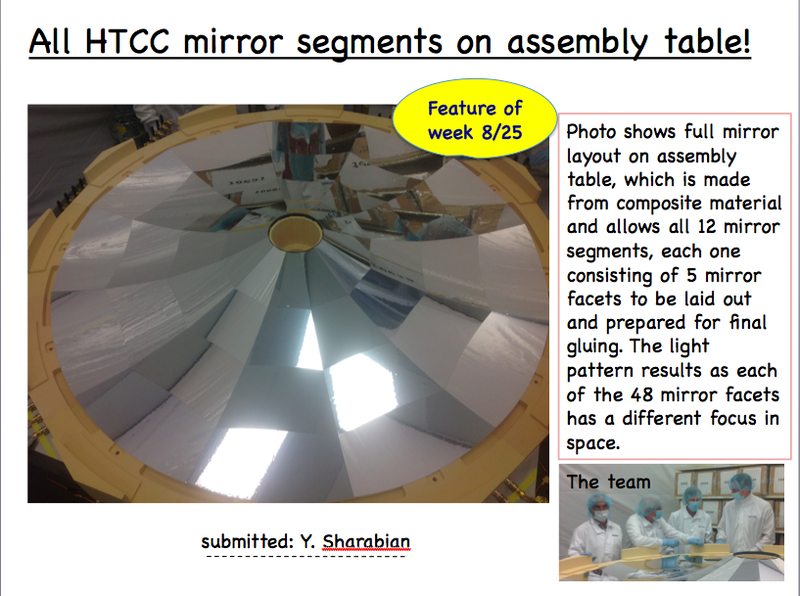 July 28, 2014 - Photograph of the first half-sector mirror assemblies for the HTCC detector. 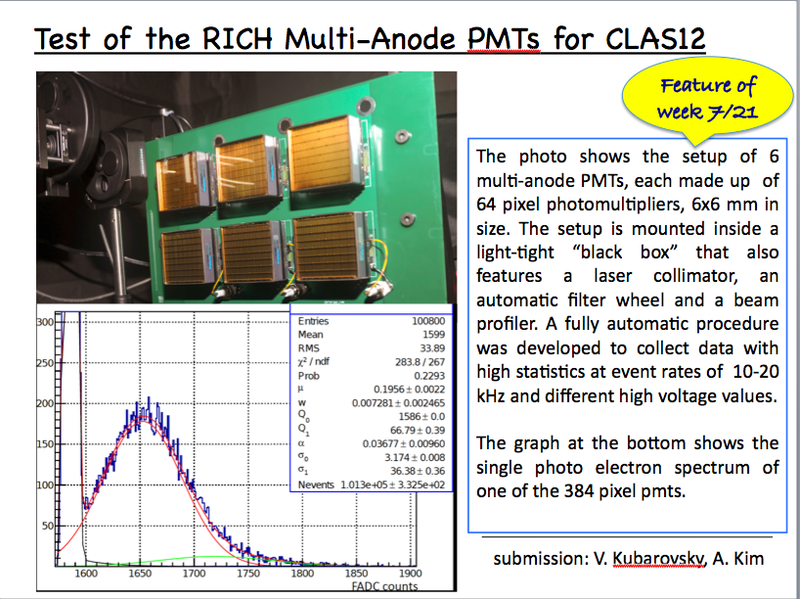 July 21, 2014 - Photograph of the test stand for evaluation of the multi-anode PMTs for the new RICH detector. July 14, 2014 - Photograph of of the ongoing assembly of the inner layer of the SVT detector. 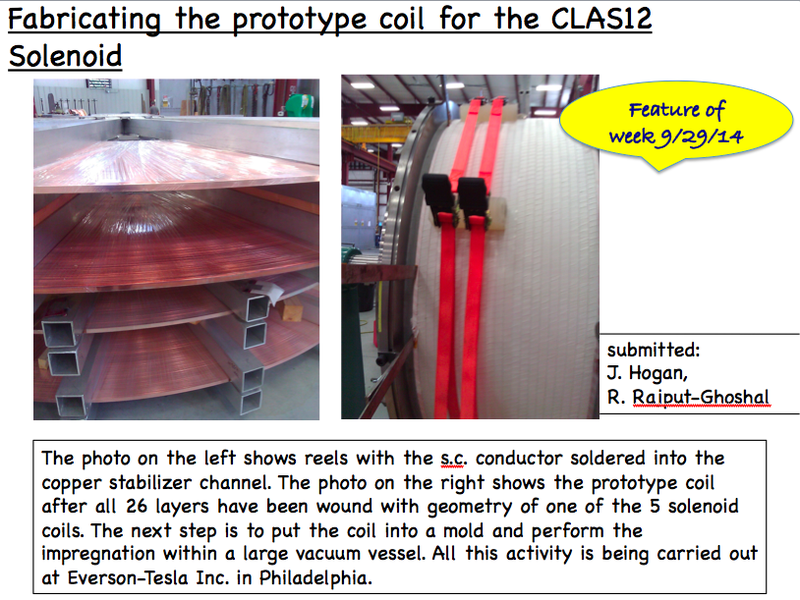 July 7, 2014 - Photograph of a small-scale test coil prototype for the CLAS12 torus after a successful epoxy impregration procedure. 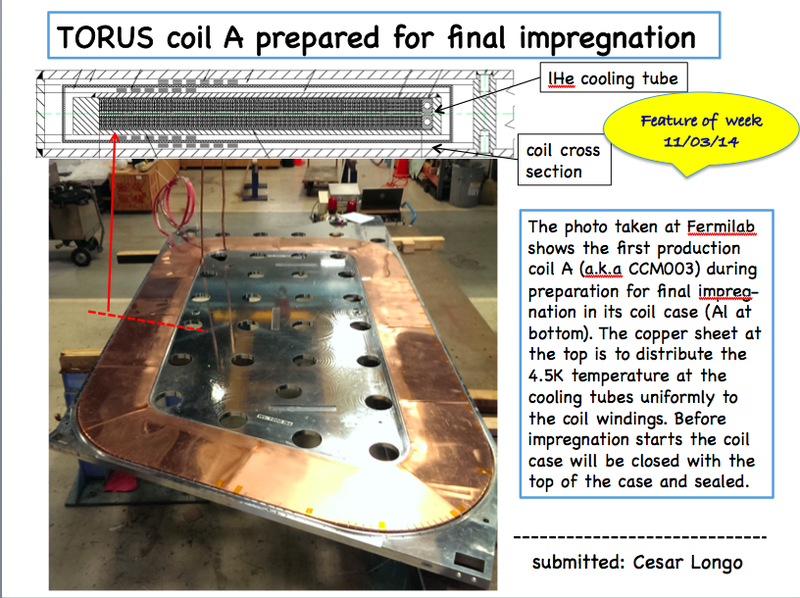 The top part of the picture shows a portion of the test coil and the bottom part of the picture shows a cross sectional view of the coil after it was cut for inspection. June 30, 2014 - Photograph of the HPS calorimeter case viewed from the top. 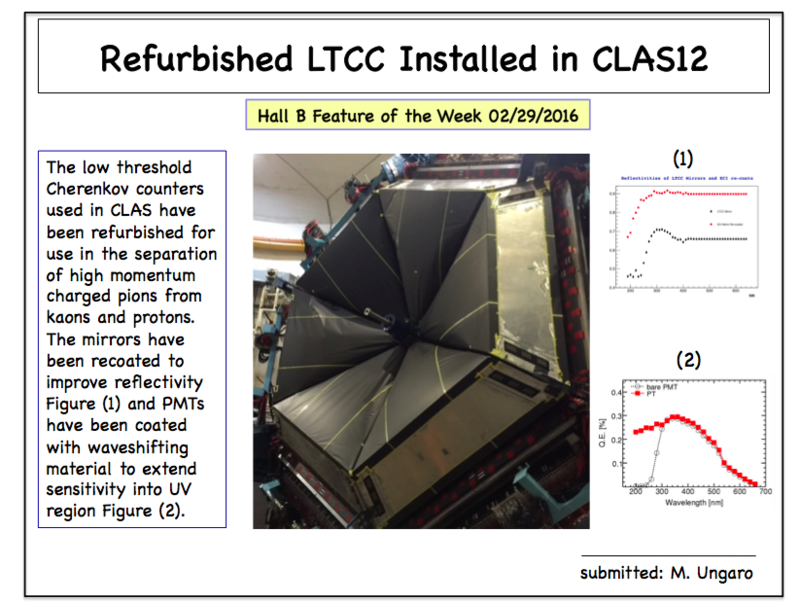 The first installed PbWO crystal is shown. 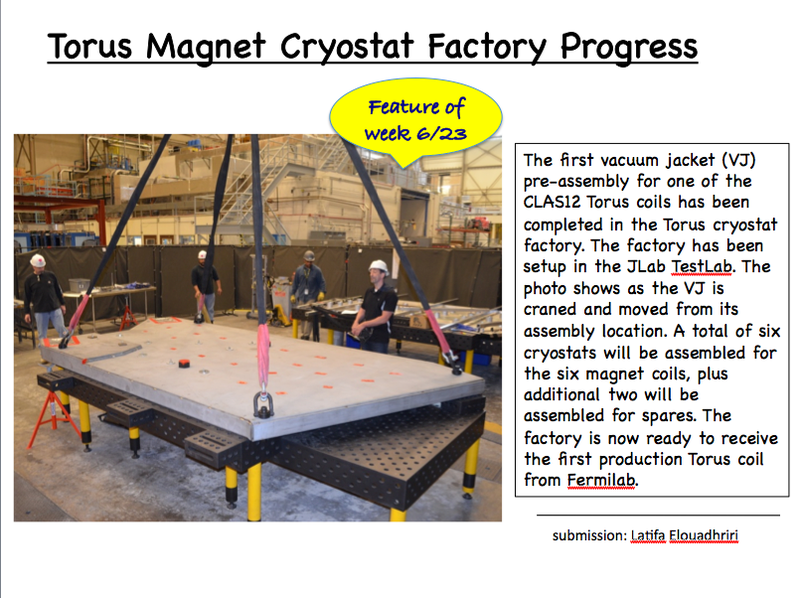 June 23, 2014 - Photograph from the JLab Torus Cryostat Factory showing the completion of the first vacuum jacket pre-assembly in the Test Lab. 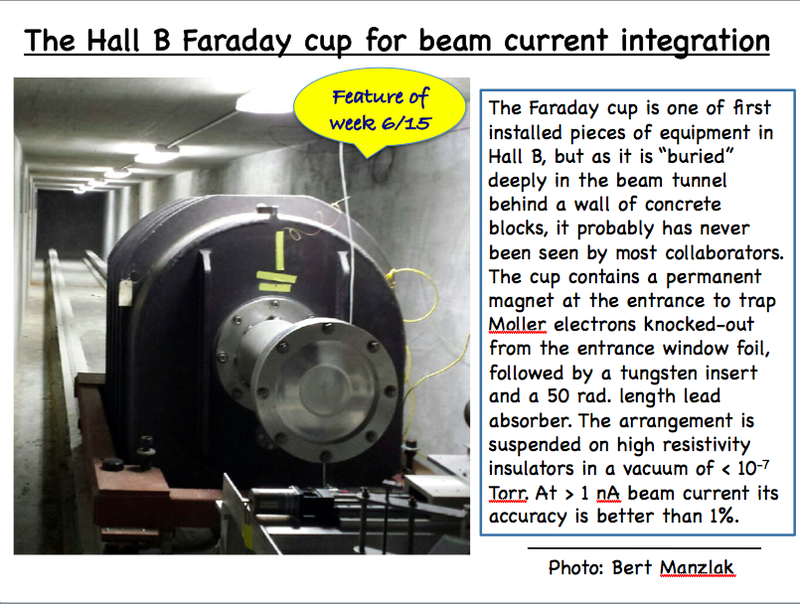 June 16, 2014 - Photograph of the Faraday Cup located deep along the downstream alcove in Hall B.
June 9, 2014 - Photograph of the recently completed chicane magnet installation for the HPS experiment in the downstream alcove of Hall B. 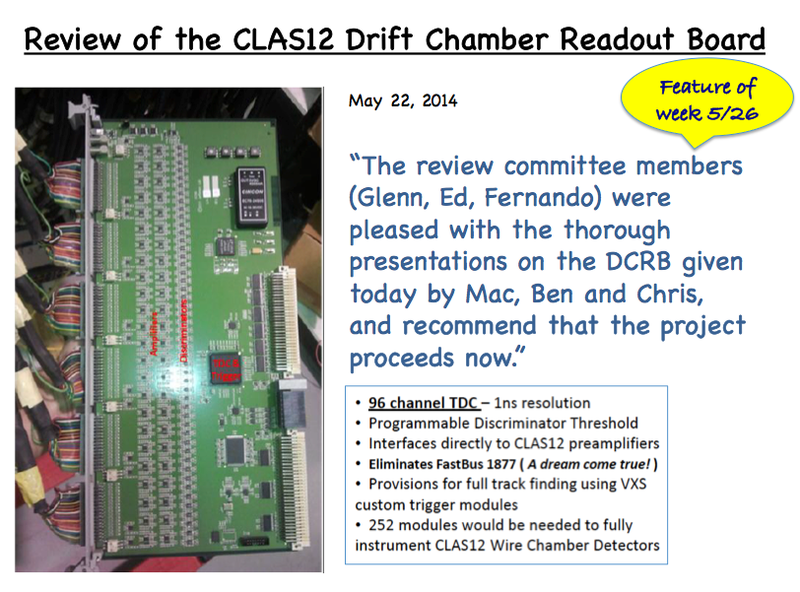 May 26, 2014 - Overview of the results of the review for the new Drift Chamber Readout Board (DCRB). 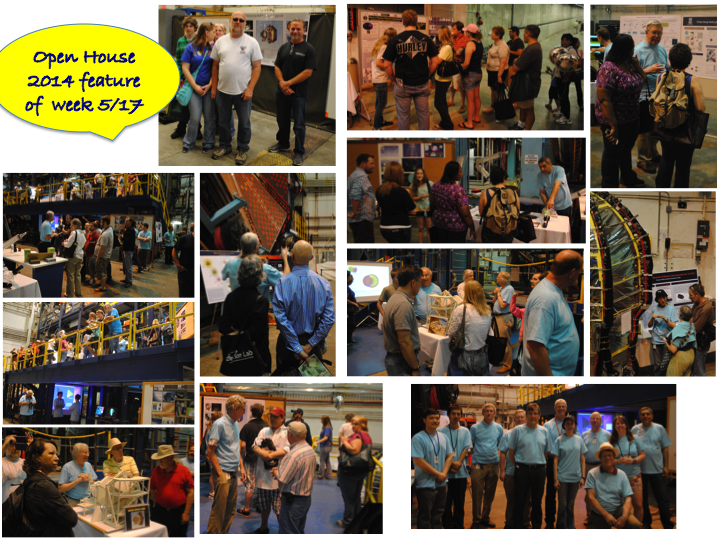 May 19, 2014 - Photograph showing a montage of photographs from Volker Burkert from this past weekend's JLab Open House. 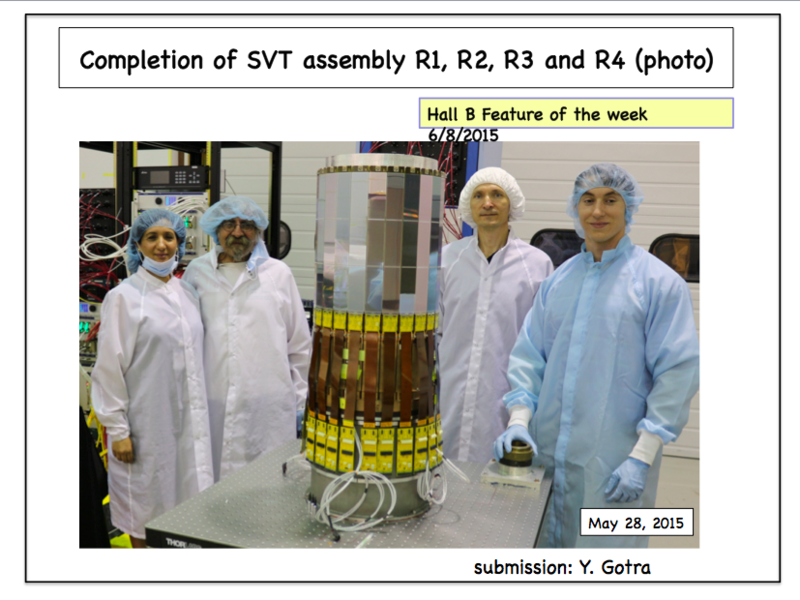 May 12, 2014 - Photograph of the R1 SVT mechnical mockup. May 5, 2014 - A new CLAS paper on the recent BONUS experiment results for the neutron structure function has been selected by PRC as an editor's suggestion. The published paper is now available. 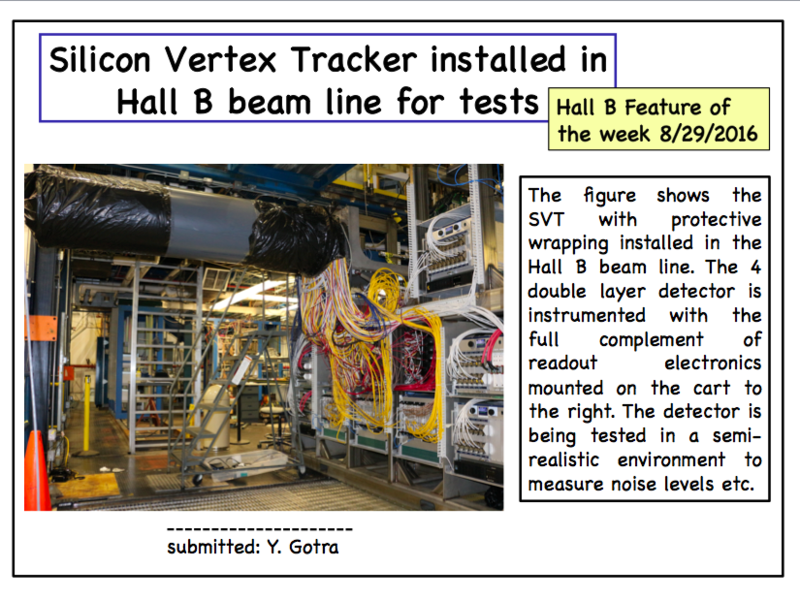 April 28, 2014 - Photograph of the platform installed in Hall B in front of the downstream alcove to be used during installation of the equipment for the Heavy Photon Search (HPS) experiment. 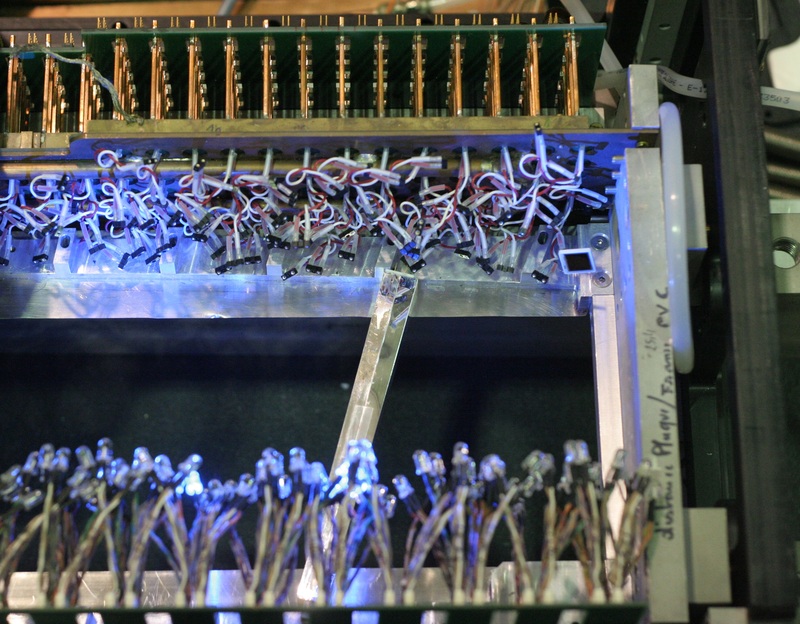 April 21, 2014 - Photograph of one of the production modules of 2x3 scintillation counters for the new CLAS12 Central Neutron Detector being constructed at Orsay. 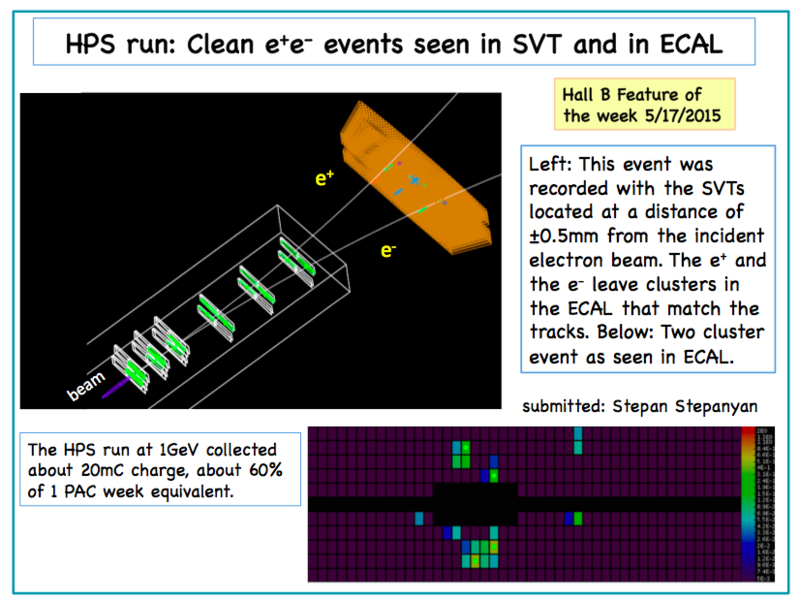 April 14, 2014 - Featured write-up in the "DOE Pulse" newsletter of science and technology highlights on the recent CLAS paper on the determination of the spin and parity of the Λ(1405). 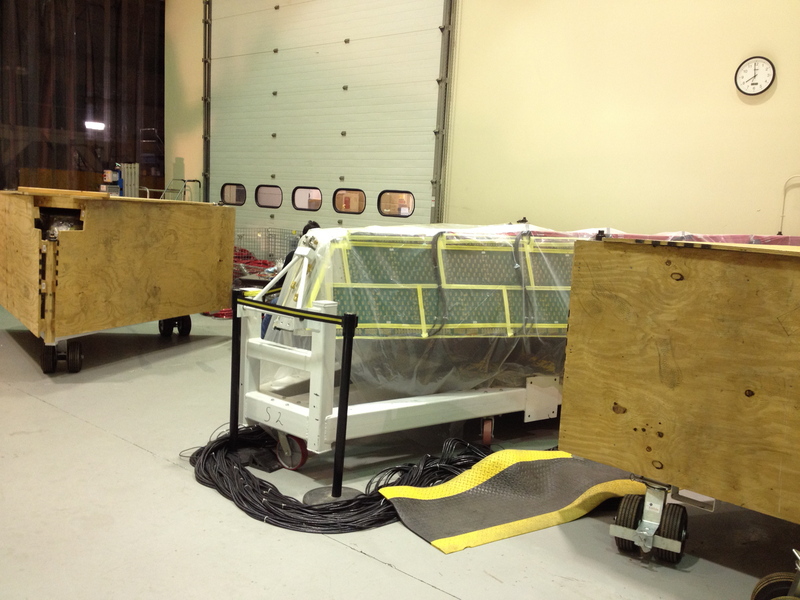 April 7, 2014 - Photograph of the final two Region 1 chambers delivered to JLab from Idaho State University. 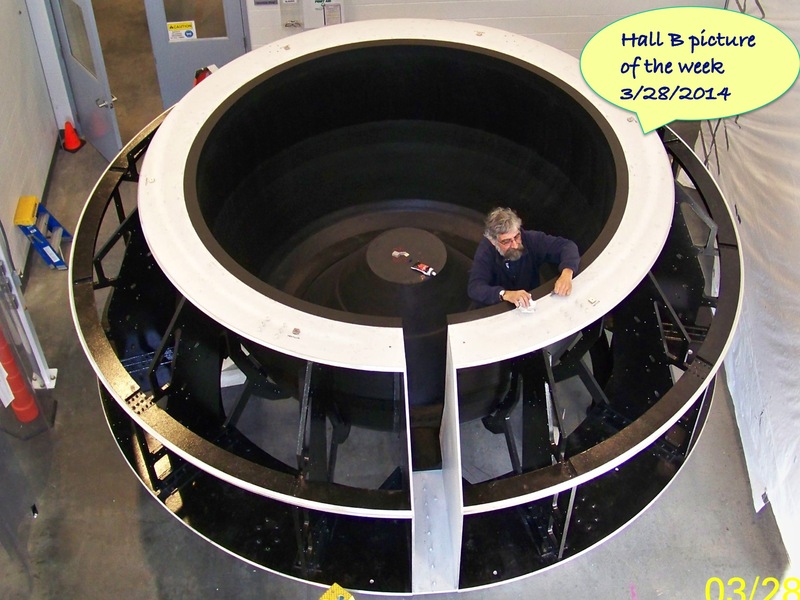 March 31, 2014 - Photograph showing Hall B technician Steve Christo working on preparations of the containment vessel for the CLAS12 High Threshold Cherenkov Detector.